Wow. What an incredible month. I cannot believe it is over so quickly. I’m actually sad to see it go as I had some of my best memories since I began running this month. 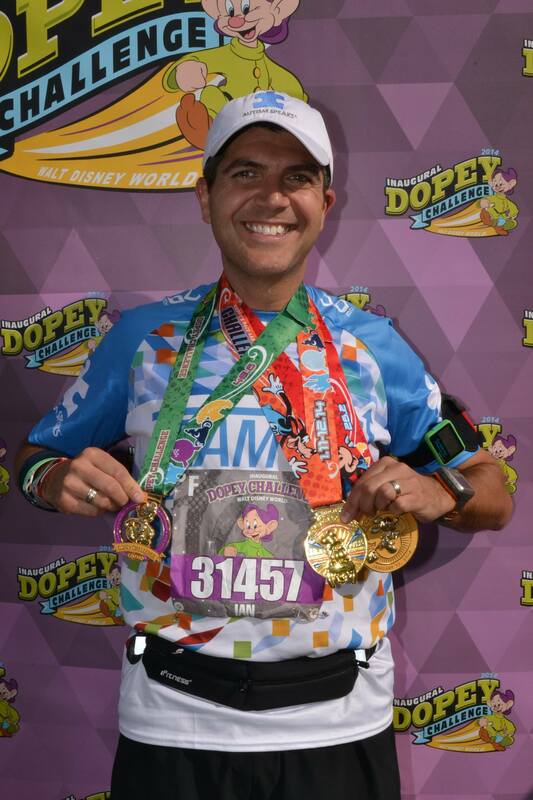 As you will probably know if you follow this blog or have read any of the recent race recap posts my big event this month was the 2014 Walt Disney World Marathon weekend and namely the Inaugural Dopey Challenge. What an amazing time I had down in Orlando. Although my family was not able to make the trip with me I met up with so many wonderful old and new friends and fellow bloggers. I had the most incredible 5 days from the Expo to the Marathon. Even with the 4 days of early wake ups I was feeling great and even at the end I felt I could have gone on for another day. All the training I had put in paid off and I felt fresh a couple of days after the race. 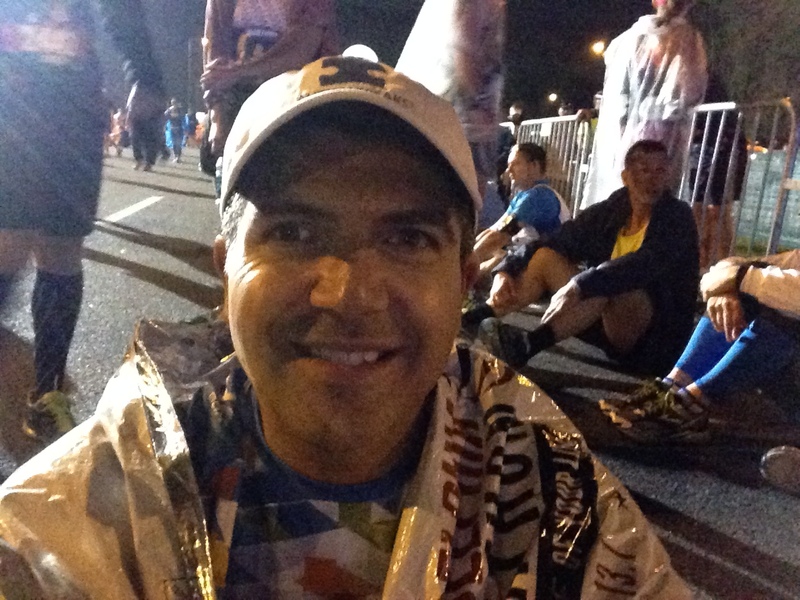 You can read the recaps here (Expo, 5K, 10K, Half Marathon and Marathon). You can also check out the following episodes of the Mickey Miles Podcast (Episodes 138 and 139) where Kimberly Markey and I shared our experiences with Michelle and Mike. 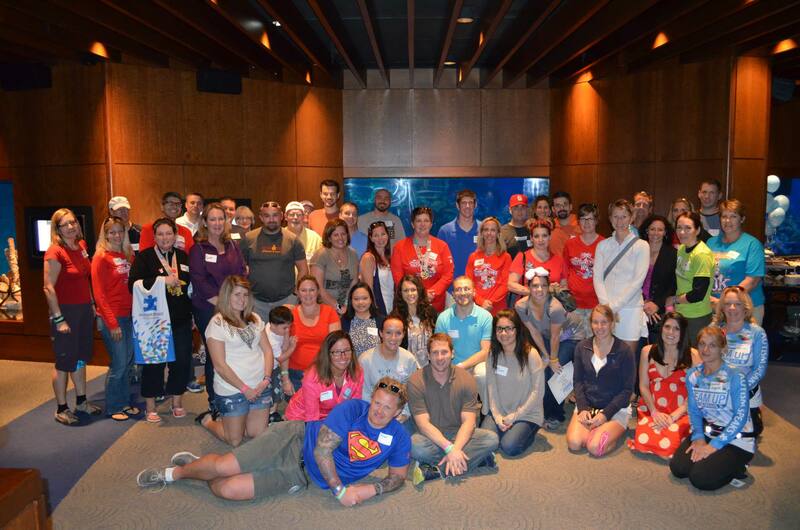 From the event I raised $3,805 (so far) for Autism Speaks. I hope they will have me back next year as I aim to take my three year fundraising total to $10,000 (2013 through 2015). 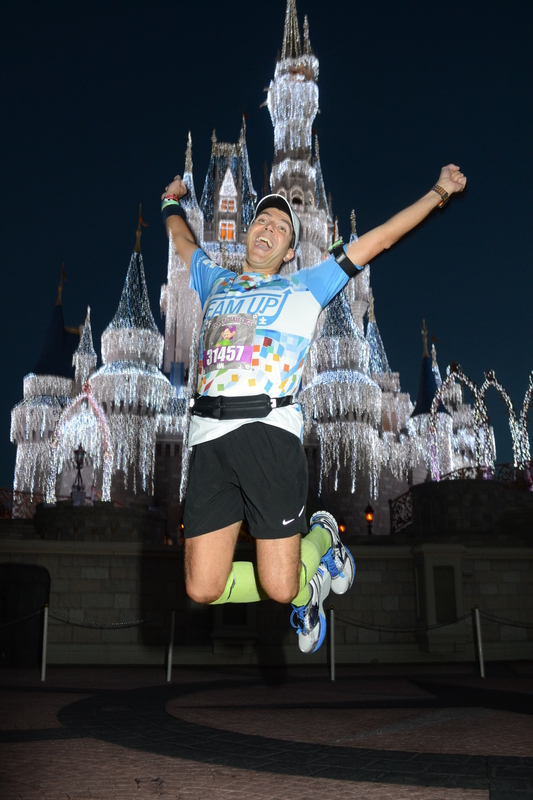 I also signed up for a running team, the ‘Mickey Milers‘, set up by Michelle and Mike of the Mickey Miles Podcast with a goal of raising funds for the ‘Give Kids The World Village‘ in Orlando, Florida. 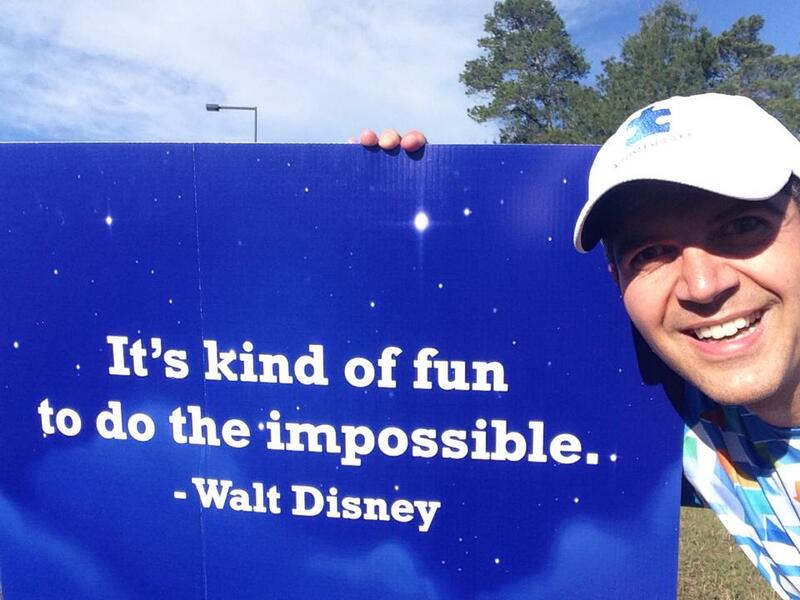 Please take a look and consider joining whether you are a runDisney fan or not. Thanks. So what is next for me? Well, I’m back in training for the New Jersey Marathon coming up at the end of April. I ran this last year and had a bit of a disappointment as I missed my goal. This is a revisit of sorts but also they hope to have the course back to the pre-Hurricane Sandy route. I look forward to that. I also have the Philadelphia Love Run Half Marathon at the end of March and the Hot Chocolate 15K in early April so a lot to look forward to. I am considering another couple of local races, the Bucks County Half Marathon in April (which I ran in 2011 and 2012) and Chasing the Unicorn Marathon in August, but I have yet to make the decision (giving my Visa card a rest for a few weeks). 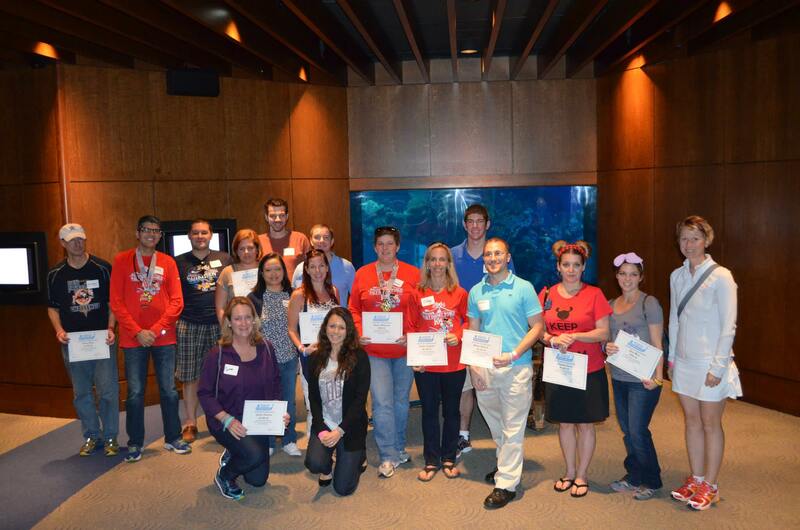 Also looking ahead I plan to become more involved where I can with the local chapter of the Achilles Foundation. I hope to be able to run as a guide for some upcoming events. I met with the chapter in Philadelphia just before New Year and I will be taking my first training run as a guide this weekend. I will keep you posted on that as I am very much looking forward to sharing the run experience with some new running friends. It’s been a busy month and a great way to start the year. Now the only thing to deal with is the weather. I have taken most of my runs indoors over the last couple of weeks. Hopefully it will not be an extreme winter but whatever happens we know that Spring is just around the corner. Looking forward to February. Thank you for reading. 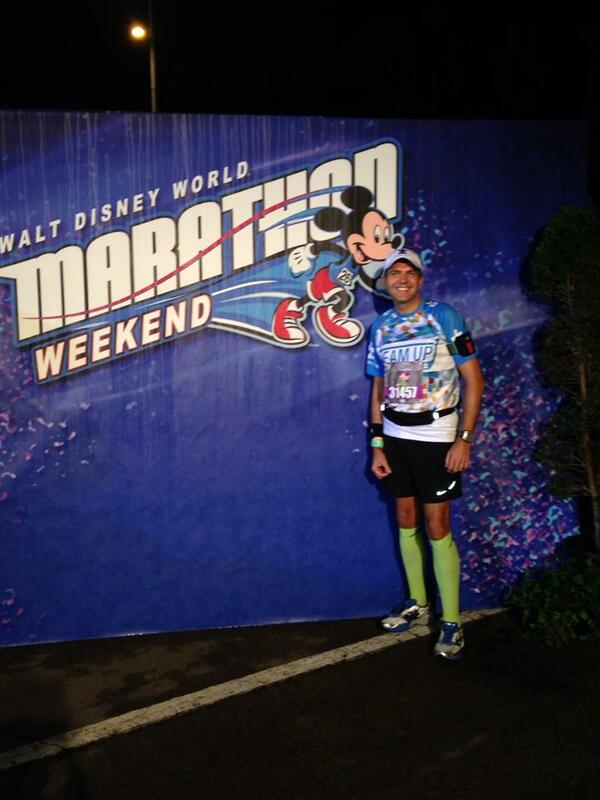 Today was the main event, the Walt Disney World Marathon. 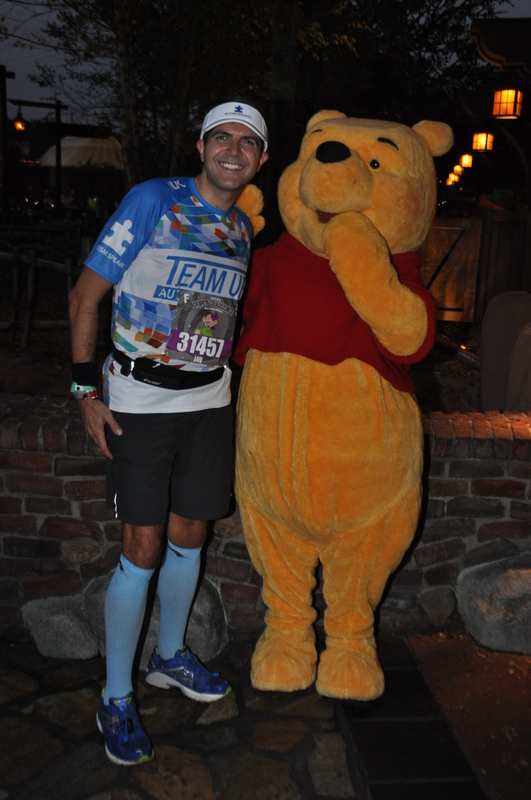 This was the last event of the Dopey Challenge and the culmination of 24 weeks of training. 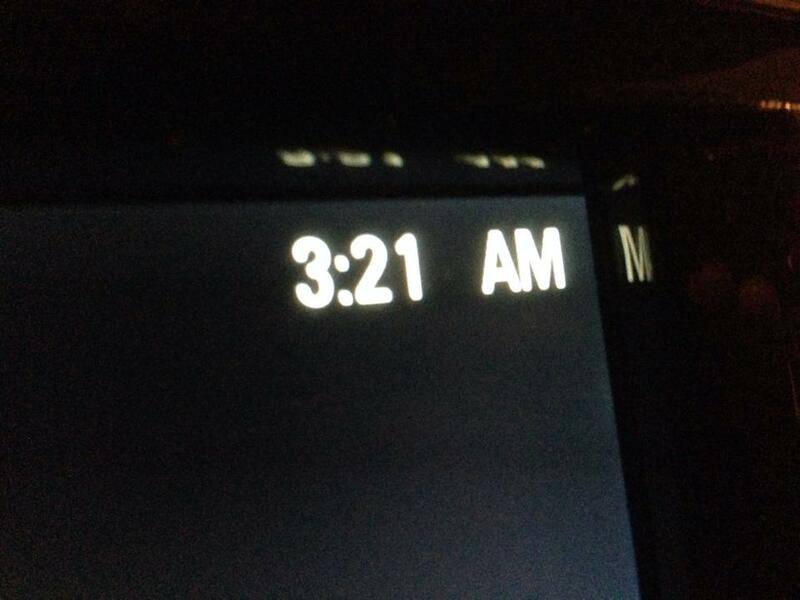 Did I mention that it was the last early wake up of the event too (score!!!) I guess with the excitement and adrenaline due to this being the big event I didn’t feel really tired despite all the previous days of running and park time. Also, with the thunderstorm the night before it cooled the temperatures quite a bit which would be great (as compared to the 2013 Marathon) So again today I dressed in my Team Up gear and coordinated my Pro Compression socks to match Dopey (you can see it was pretty close later in the recap) and headed out for another early arrival at EPCOT for the start of the race. It was cool with a slight breeze as I walked towards the bag check area. After last year of bringing down throw away gear I got smarter thanks to a very helpful tip. I tend to keep those mylar blankets they give out after marathons and they are small and light enough to pack with no problem. I wore my blanket from essentially the time I got out of the car until the start of the race. It was easy to pack up in my gear back and doubled as something to sit on later in the corrals while we waited. I didn’t see many familiar faces in the starting area this time around although I did bump into a new Facebook friend (Jennifer) who spotted me as I arrived. 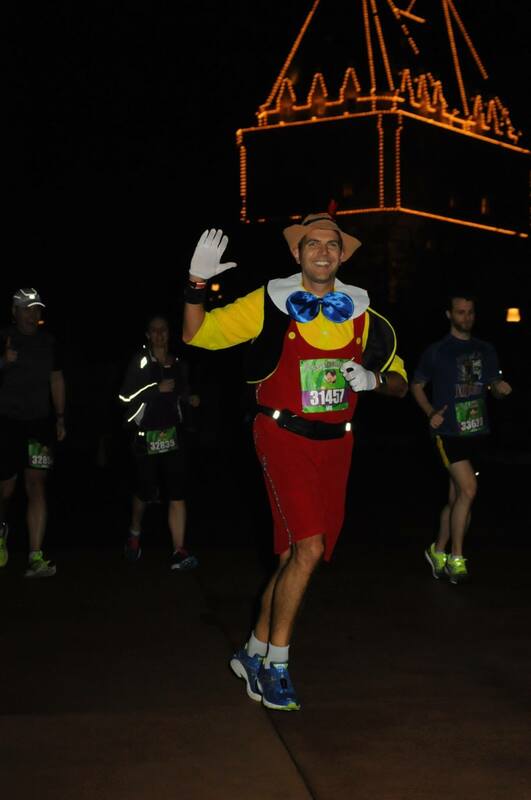 She was running her first marathon as part of the Goofy Challenge. I headed through the bag check very early as like the day before I wanted to get over to the corral and sit for as long as I could to rest up before the 26.2 miles which lay ahead. 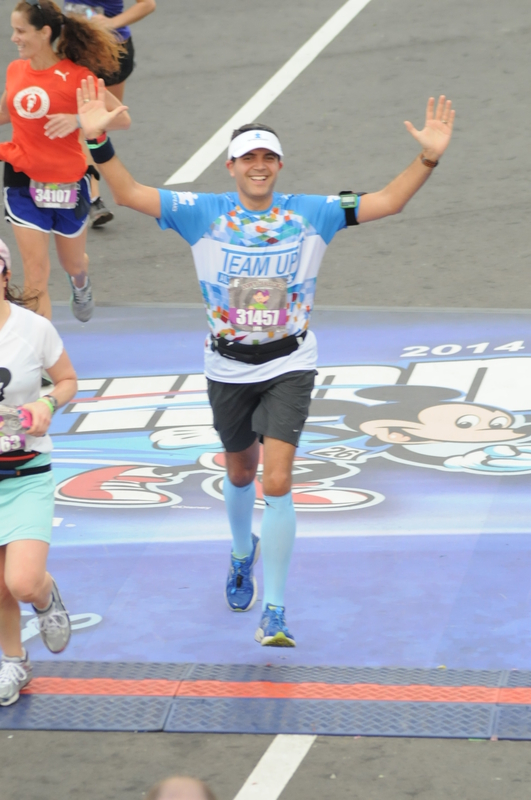 I will admit that this was probably the most calm I have ever felt during a marathon. This would be my 7th marathon so I knew I could do this but I think due to the continuous high from the weekend I was just relaxed. Anyone who knows me well (read ‘my wife’) will tell you I am always a little uptight before a big race. Today was just, in my head anyway, a long run and I was going to treat it that way and have fun. Time didn’t really matter to me much. 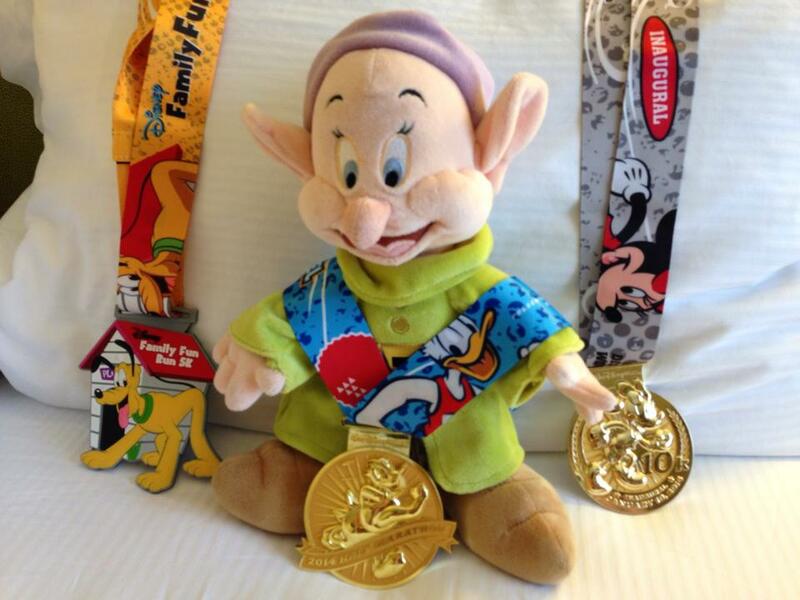 It was day 4 of the Dopey Challenge and I was there to have fun and make it to the finish line. As we all started the long walk to the corrals (via ‘Backstage Lane’) I started chatting to a few folks, some doing the Dopey, some Goofy and some running their first marathon. With words of encouragement being shared among us it really felt more of a communal long run than a big city race. 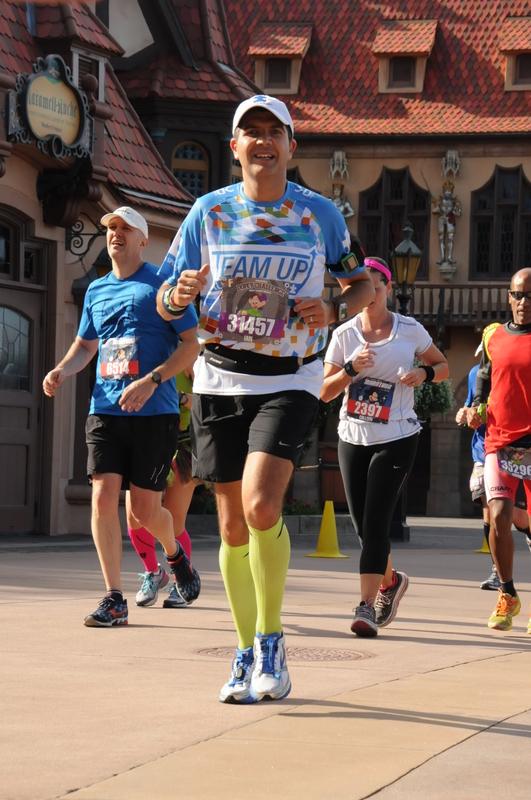 People running a Disney race bring with them an expectation of fun and camaraderie that I have not experienced in many of my other races. Sure you say ‘hi’ to people but people just seem more open to chat about the events. It could be the nature of these multi-race events which is unique and everyone is checking to see how other people are doing and sharing thoughts. Just my opinion really. As we approached the split between corrals A to H and I to P one of the people I was talking to suddenly said, “Hey, you’re Ian from ‘Philly2Goofy’. I thought you looked familiar”. I was totally taken by surprise, especially being as dark and so early in the morning. They said they had followed the blog and actually printed out the training plan I was following and stuck it up on their wall. I was flattered (although all the credit must go to Hal Higdon and Jeff Galloway as I wouldn’t be here doing this without them). That totally lifted my spirits higher and I cheerfully headed to the corrals. I didn’t see Mark or Rob who I knew were supposed to be in my corral so I took a seat and waited while watching the pre-show. Various folks were brought up and interviewed including Dave McGillivray, race director of the Boston Marathon and Jeff Galloway. 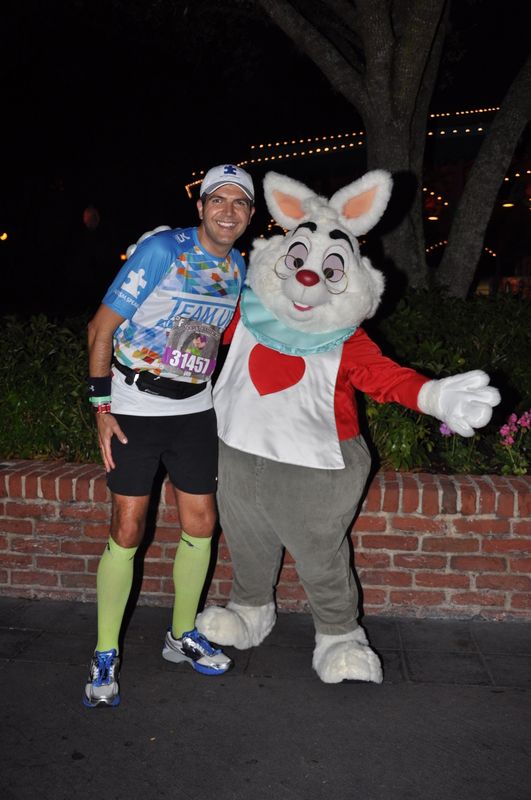 Both were running Dopey along with me and the other 6,999 folks. During the pre-show one of the race announcers (or interviewers I forget which) ask who was ‘just doing the Marathon’. 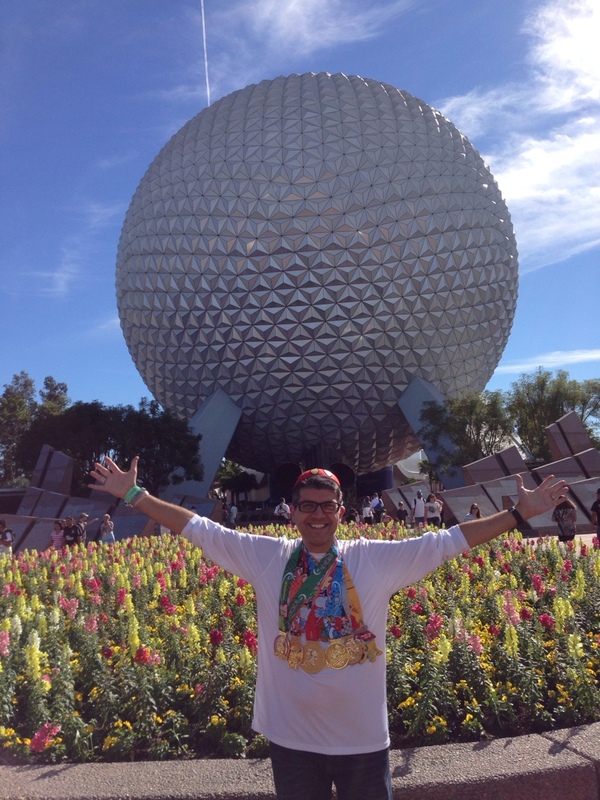 Let me say now for all readers and runners…THERE IS NO JUST…anyone out there running a Full Marathon is a champion and just because there are other challenges out there that runDisney has made popular should not in any way diminish the awesome experience and success of a person training, running and finishing a Marathon. I guess it is only at a Disney event when someone says of themselves I’m “just doing a Half or a Full” or even “I’m just doing Goofy”. Everyone is a runner and a champion for just toeing the line. There, I said it!!! I’m of my soapbox now. 🙂 Soon we would hear the ‘National Anthem’ and we knew we were ready for the start. Mickey (and even Dopey earlier before the race) was there to count us down and with fireworks shooting off we were starting. Yes, I got my fireworks today 🙂 All was good in the world. And then we were off. My strategy of stopping for photos early the day before worked well so I could maintain a steady pace going towards the Magic Kingdom where I knew I would be spending lots of time today. It wasn’t long before I saw that we were approaching the start of the way towards the Magic Kingdom and the Ticket and Transportation Center. It was encouraging again to see so many folks out cheering the runners as we approached the Ticket and Transportation Center and as we moved onwards towards the side of the Contemporary Resort we got our first view of the day of the Magic Kingdom. 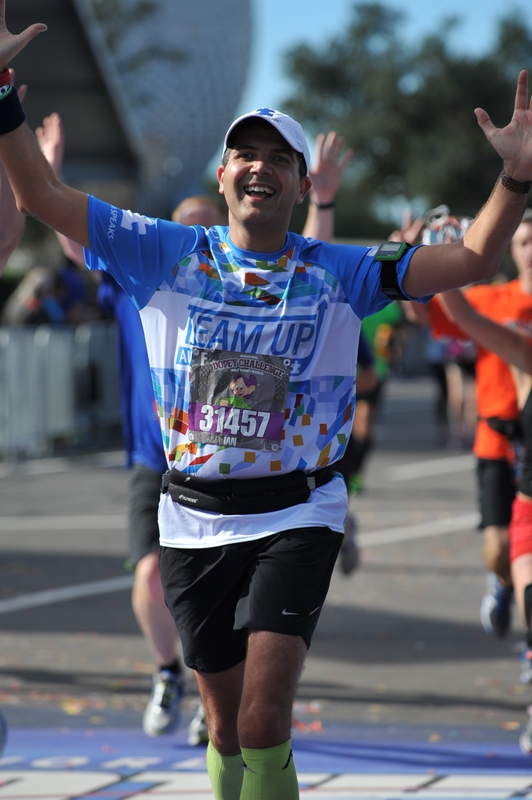 You will know from my recap from the Half Marathon yesterday how much I enjoy running into the Magic Kingdom and up Main Street USA. It is always magical. Today was as magical but also special. 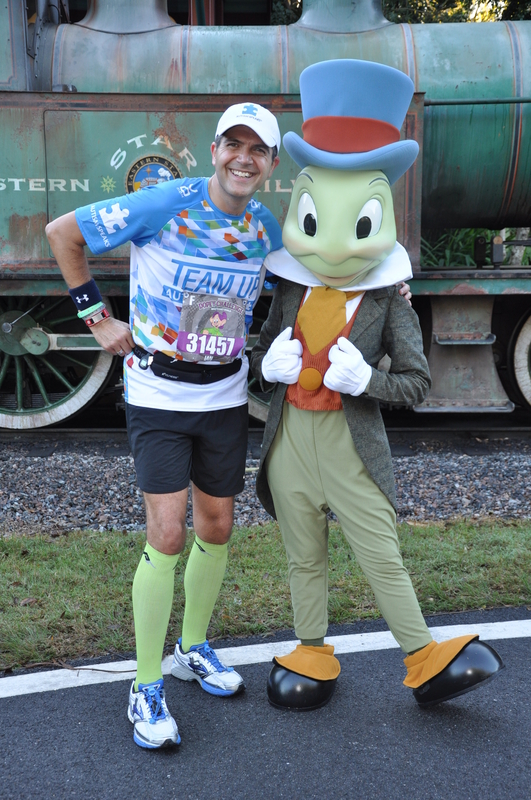 As soon as I ran onto Main Street I bumped into Joe Taricani, the host of ‘The Marathon Show‘ podcast. 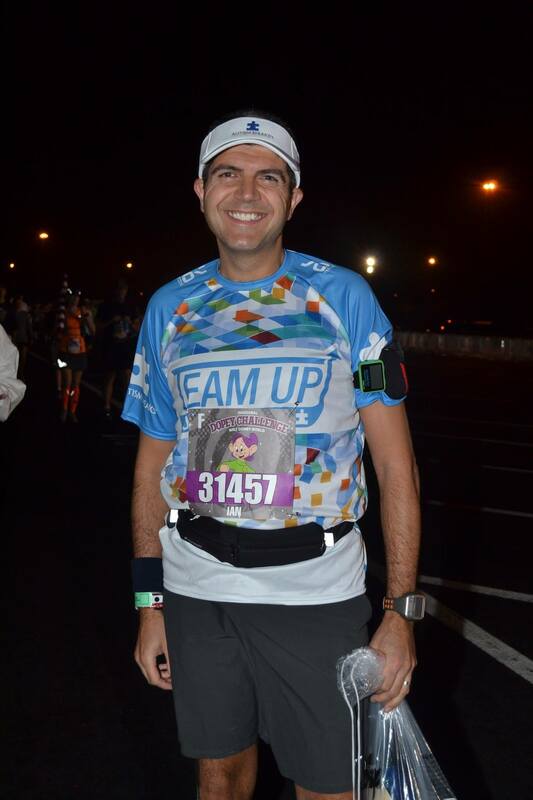 Joe runs holding an ‘On Air’ sign and speaks to runners as they experience their journeys. Today I got to run up Main Street with Joe and even made it onto the podcast. Another great experience and one that adds to the memories of this weekend. Check out Episode 228 to hear the recap of the day. In all of this I still managed to get my Main Street USA photo to make the day complete. 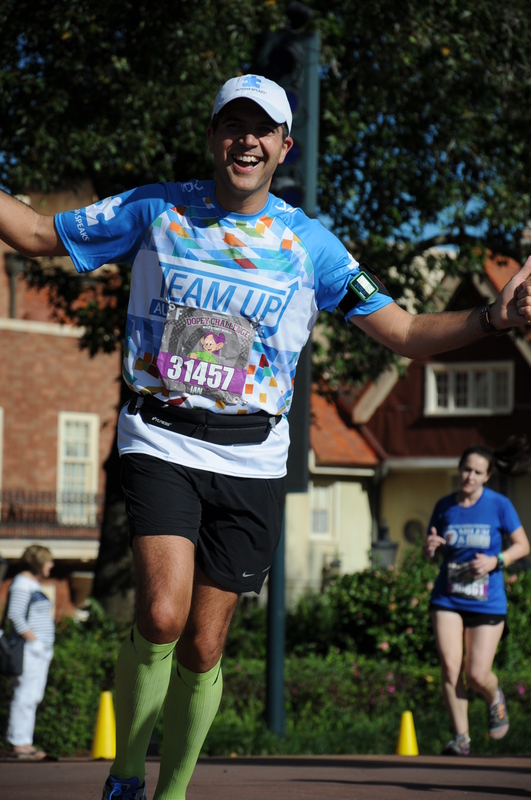 I had a specific goal for the Marathon this year in terms of photos in the Magic Kingdom. For the last two years I never got a shot of Mickey at the Castle. This year no matter the lines I was going to do it. 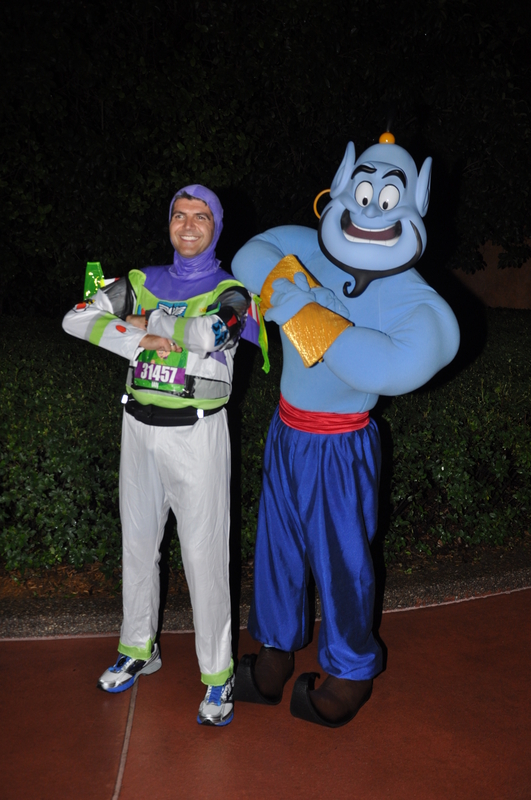 I did notice as I ran through Fantasyland and the New Fantasyland that there were less characters out this year. Last year it was all Princesses outside New Fantasyland but this year there were none. I ran through Frontierland but didn’t stop for photos this time but headed backstage to exit the park. I finally found a Princess and stopped for a quick photo. Coming out of the Magic Kingdom we are around mile 6.5 and begin our little trip up Cone Alley past the Grand Floridian towards the Speedway at mile 8. Again, no Mary Poppins today. She was hanging out with the Penguins in Race Retreat. There were a couple of character stops along the way. 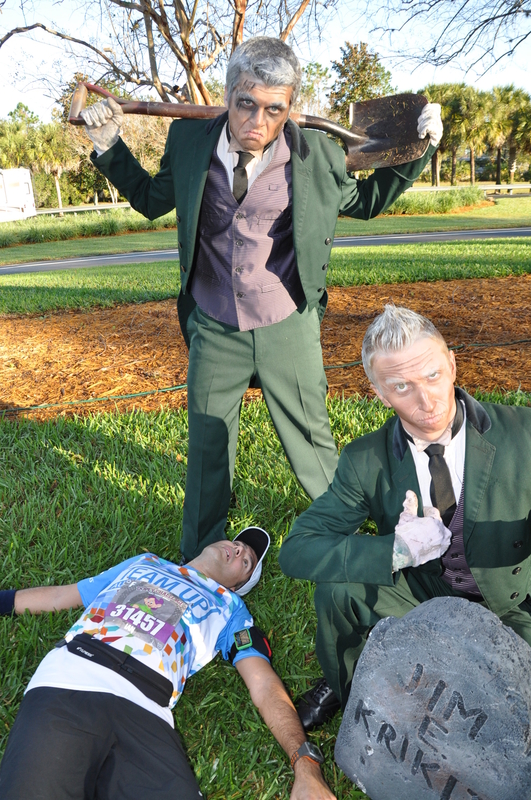 I even stopped for the Villains this year which was a first for me. We hit the Speedway just after mile 8. 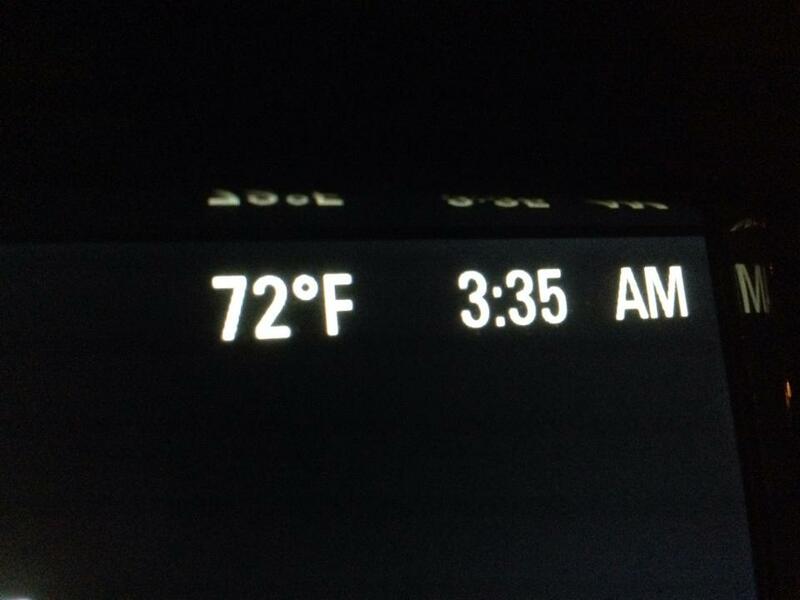 I remember last year the sun was up at this time and the heat was already up high. This year was much cooler but there were some wet patches under foot which wasn’t great around Cone Alley as you sometimes run along some grassy areas trying to get around other runners. 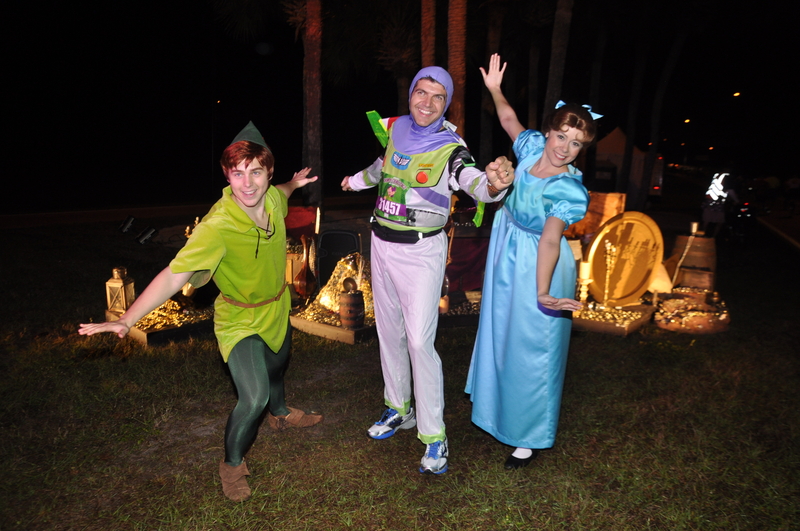 As we approached the Speedway I noted there were no characters outside like there were last year. Again, less characters throughout the course this year. When entering the Speedway there is a really narrow and steep downslope and upslope onto the circuit. As it was still wet underfoot the runners ahead had slowed down and there was a slight bottleneck at this point but once out on the track it opens up. The trick is to stay on the inner circuit of the track as it is flat with no banking. As was the case last year there were car clubs represented as you ran around the circuit. Different from last year was that there were no ‘Cars’ characters out on the track. This was fine with me as it allowed me to just keep running. I had spent a lot of time in the Magic Kingdom and although I wasn’t going for a time goal at all it was nice to just get a nice rhythm going. 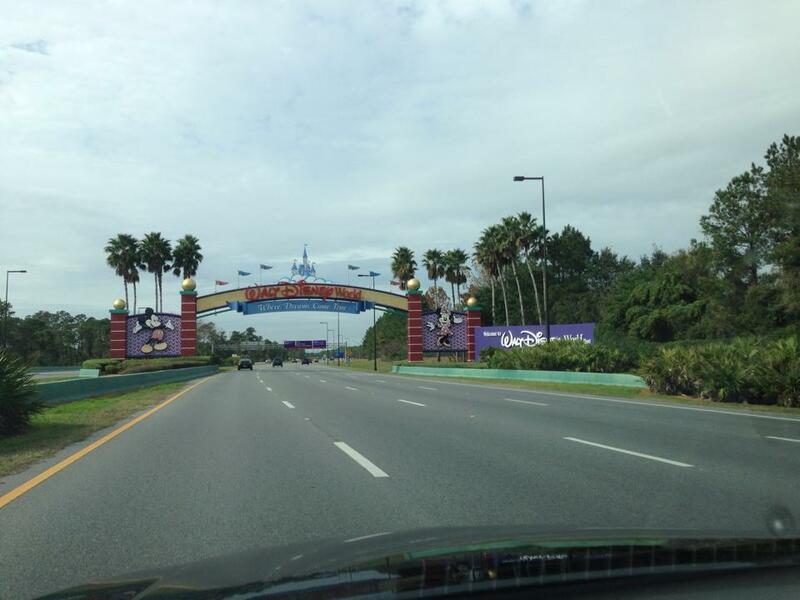 As we excited the Speedway there was a quick trek over a grass median and we were off towards the Animal Kingdom. This is the part of the race that takes us past the Water Treatment Center. Well, the good news with the cooler temperatures and the slight breeze, there was no smell when I ran past this year. BONUS!!! I’m usually taking an energy gel around mile 10 so glad I didn’t have to deal with any added ‘extras’. As I approached the Animal Kingdom I heard my name being called. It was Mark my fellow Team Up teammate. I hadn’t seen him earlier in the day while waiting in the corrals so I actually headed back to catch up with him to check in. 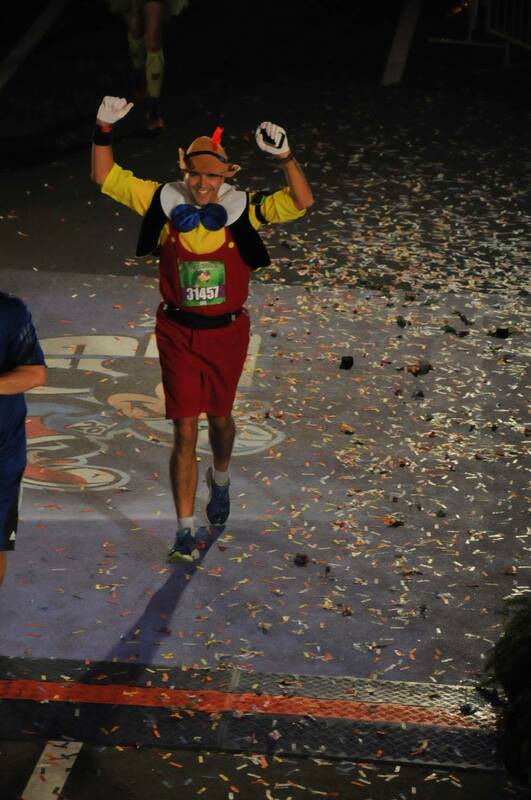 He was nursing a leg injury which he had coming into the Goofy Challenge but he looked strong and I know that he did finish as I saw his results later on. 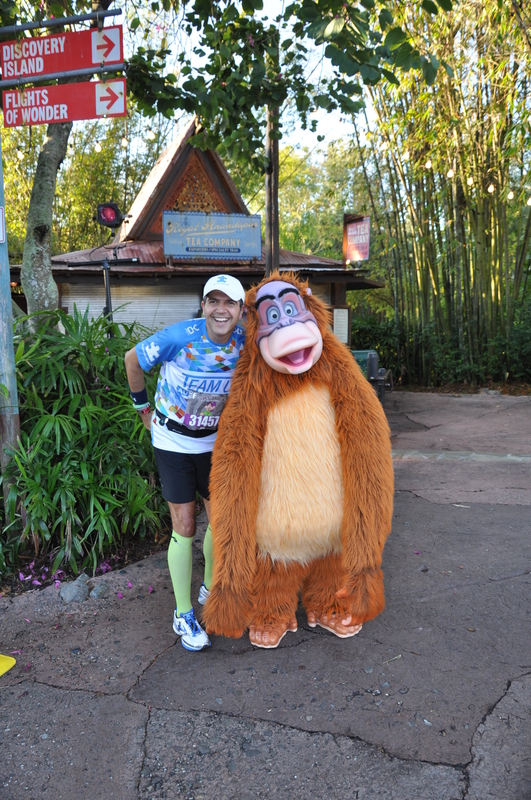 After saying good luck I headed into the Animal Kingdom just around mile 12. As we entered the park we ran past a variety of animals with their handlers. I found out later that the animals were all wearing special Marathon bibs with their names on. Cute. At the time that I arrived in the Animal Kingdom the ‘Expedition Everest’ ride was not yet open for the day. 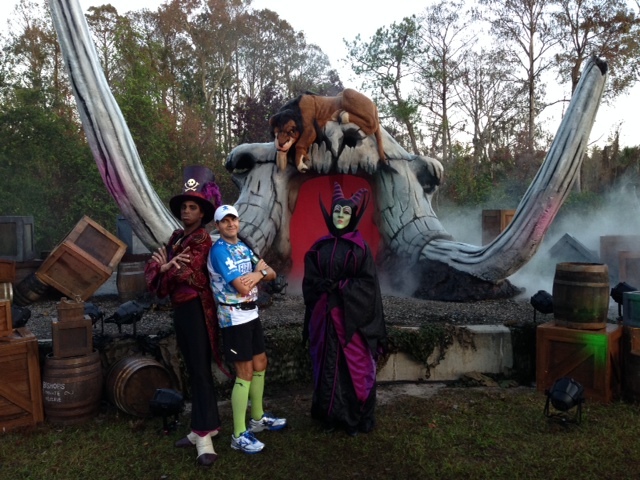 Some of my fellow runners behind me took the opportunity to stop and ride ‘Everest’ on their way through the park. 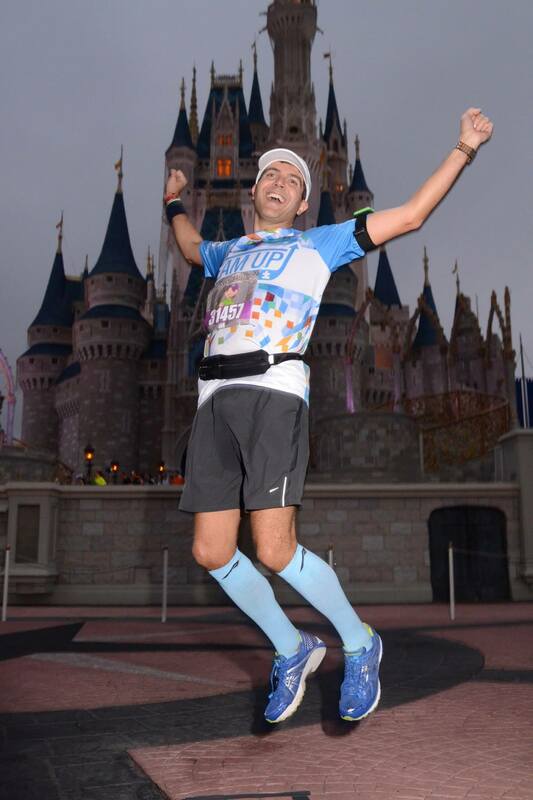 It’s a Disney race, when else would you stop mid marathon to ride a coaster? Awesome. We were very close to the halfway point at this stage of the race and we cleared the Half Marathon timing mat just after the water stop leaving the park. This was also the location of the Autism Speaks cheering section today so I made sure to say a big thank you to everyone for coming out and supporting the team. I hit the half way timing mat at a time of 2:27:55, this was 15 minutes quicker than I had actually run the Half Marathon the day previously including all the photo stops. It was a complete adrenaline rush. I don’t know where this energy was coming from especially 4 days and 35 miles in at this point but I felt really good. The next stop on our journey would be the ESPN Wide World of Sports it is a long stretch (well 4 miles) from the Animal Kingdom to ESPN and there isn’t much to see around here. It is pretty wide open at this point and runners spread out. It’s nice to have some space after running in some tight lanes through the parks. During these part of the race Scott who I had met at the 5K spotted me and we ran together for a couple of minutes. We are both Galloway runners and we were running different intervals so we said our goodbyes when the timers went off. Scott looked like he was doing fine. Glad to know that everyone I had met up with over the weekend seemed to be doing fine. The weather today was definitely a positive factor for everyone today. The ESPN Wide World of Sports is the one part of the course that I just find takes too long. I know it sounds silly as it’s only 3 miles but with all the twists and turns we take, maybe it’s just psychological, but when you think you are close to leaving you hit another turn and it is not the way out. At least this year was cooler (I’ve said that before a few times). As I entered the ESPN Wide World of Sports I made sure to grab a wet towel that they were handing out. Last year I missed it and regretted it. This year the towels were ‘ice’ cold. I squeezed the towel over myself and immediately regretted it. There was still a slight breeze and I started to get the chills. Eek! I knew I would warm up but for the next mile I was shaking my shirt to try to dry it out a bit and warm up. Oh well, live and learn. One of the cool things about running around this part of the course is that you get to see all the athletes getting on with their day of training and games. We ran past a soccer game in progress and there were many spectators on the course at this point. The ESPN Wide World of Sports also includes a lap around the outfield of Champions Stadium (spring training home to the Atlanta Braves). 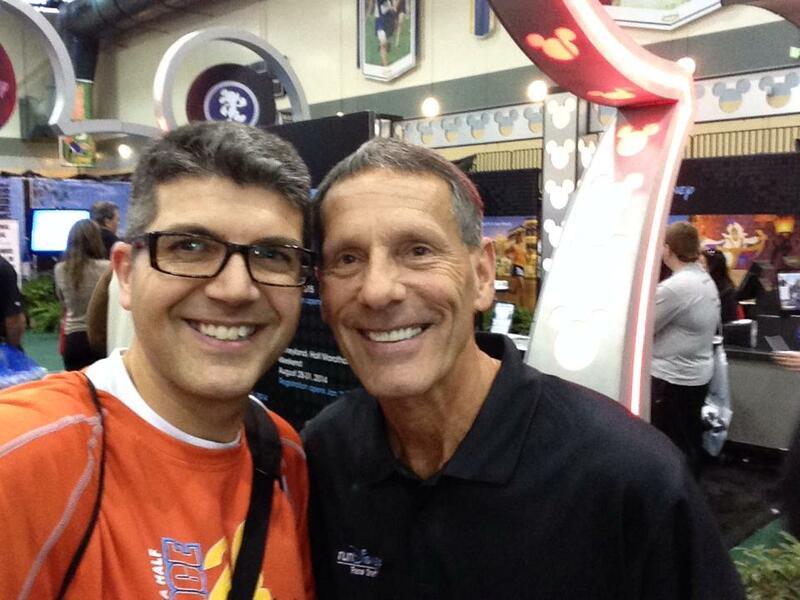 Here I am going to share my biggest tip from running through the Wide World of Sports. As soon as you leave the stadium if you suspect at all that you have any gravel in your shoes stop and empty your shoes. You still have over 6 miles to go and you don’t need anything that will annoy you or irritate you. I’m talking from experience. This year I stopped and took out plenty of gravel. Phew. 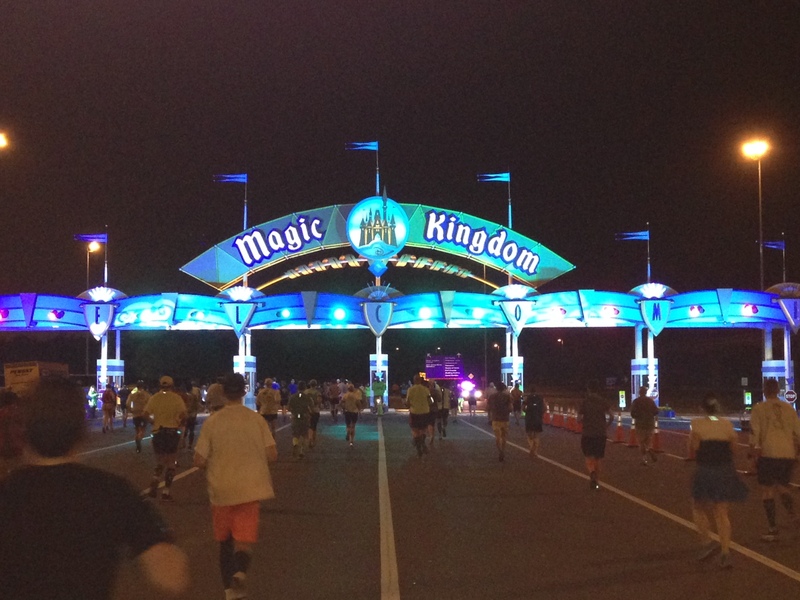 At the end of this 2 mile stretch there is the final ‘big hill’ of the course, the overpass to Hollywood Studios. 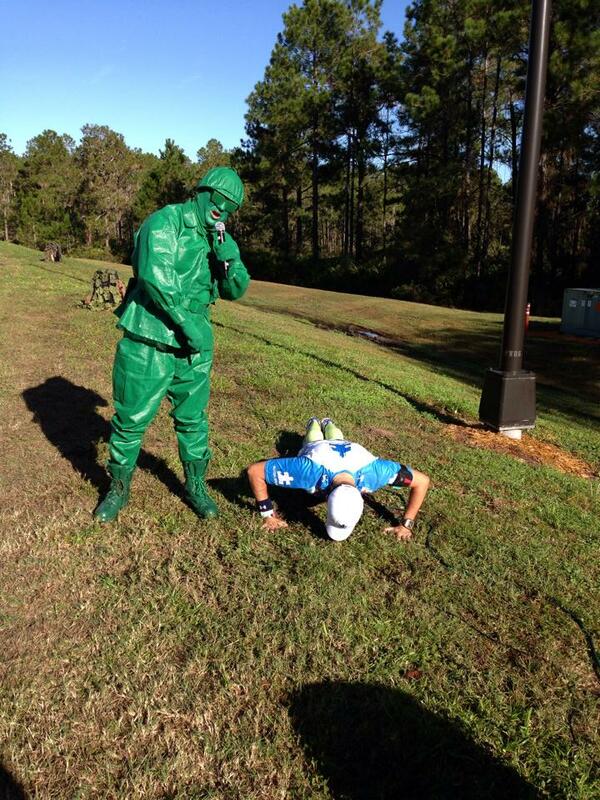 Each year I have run this event they have had a toy soldier from Toy Story yelling out to runners to get up the hill. Again, this is one of those places that in previous years I have seen runners doing push ups with the drill sergeant (the crazy folks I liked to call them). Well, welcome me to the crazy club. I was feeling good and had the energy and I got down and did my requisite push ups to earn my photo opportunity. At this point I know I’m 4 miles to the finish. I was getting very excited at this point. I knew the rest of the course from prior years and I knew I felt better than I had the last two years that I had run so I just went for it. I picked up the pace a little. We entered Hollywood Studios just behind Tower of Terror and rounded the corner to head through the tunnel alongside the costume department. Then you have the amazing view when you run up the Streets of New York and head towards the front of the park past the Sorcerer’s Hat. Other than Wreck-It Ralph as we entered the Studios there were no other character opportunities here. Last year there were three. A little disappointing but at this point in the race with only 5K to go you just want to keep going. The parks were now open and guests as well as supporters were now cheering us on. 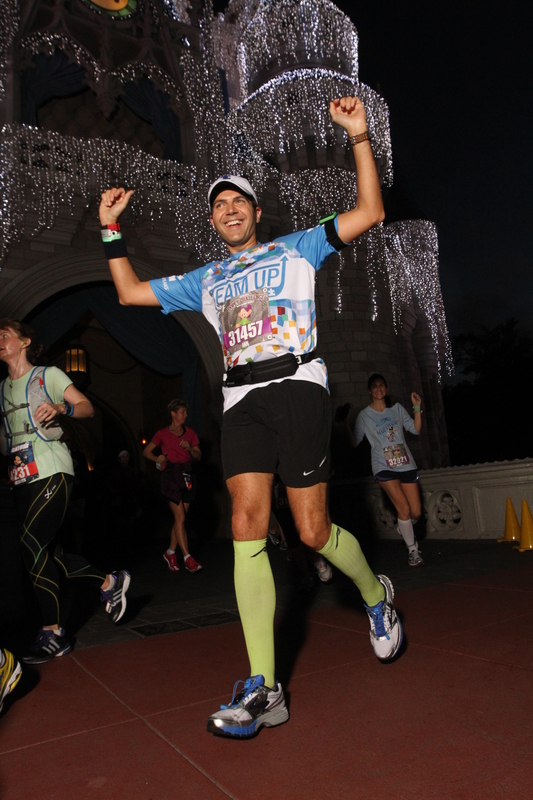 I have heard many stories of guests being inspired by the runners to look into running a runDisney event in the future. I hope that we inspired one or two (or more) today. After the Studios we head along the Boardwalk through the International Gateway and head towards World Showcase. When you hit the United Kingdom you are reaching mile 25. You are almost there. Essentially, barring a major disaster you can run, walk or crawl your way home. No one will take you off the course once you make it to here. 🙂 As I ran through the Magic Kingdom I heard my name being called out. I wasn’t sure from where but I later found out that it was Jill (one of my Facebook friends) who sent me a note later to confirm I wasn’t just imagining this. I ran through World Showcase stopping for a photo with a couple of French-speaking ladies in the France Pavillion and then headed towards future world and the finish line. I cannot tell you much about that last mile other than it being a blur of complete and utter happiness. 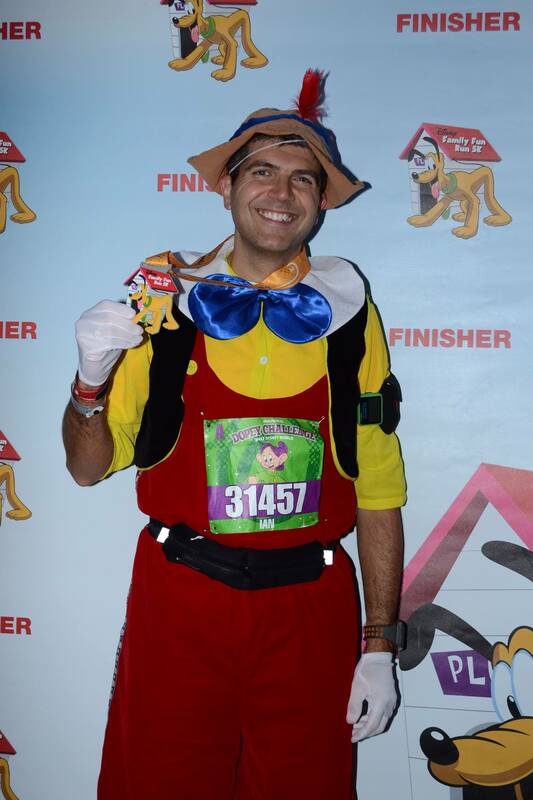 I was doing it, completing the Dopey Challenge. Feeling great and realizing 9 months of fundraising and 6 months of training. 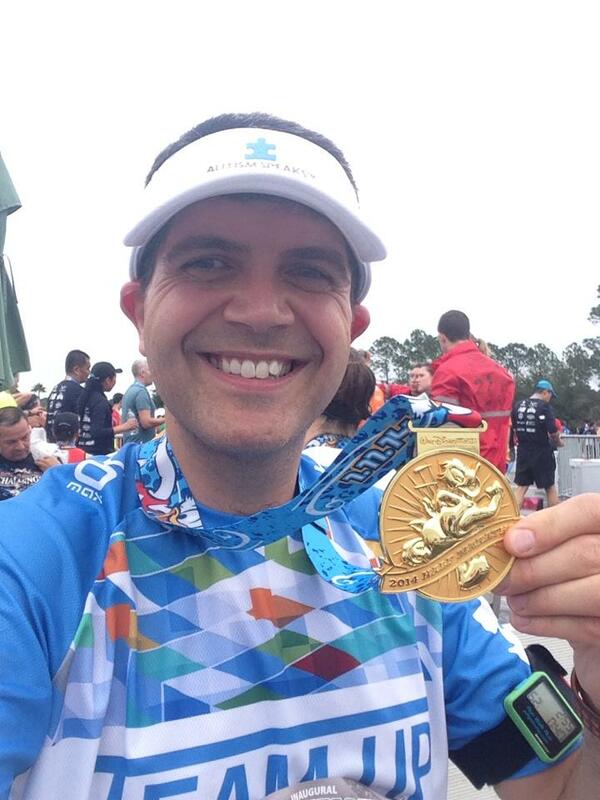 In the process I recorded over 700 miles of training and raised over $3,800 for Autism Speaks. MISSION ACCOMPLISHED!!! I even ran the second half of the Marathon in around 2:12:30, 10 minutes faster than the first half for an overall time of 4:40:26. I got my Marathon medal and headed over to the self-treatment area to ice down (I had a plane to catch in a few hours) before heading out to pick up my Goofy and Dopey medals. Seeing as I had to leave later that evening I didn’t really have too much time to wait around after the race. I headed back to the hotel to shower and finish packing with the goal of spending as much time in EPCOT before I had to head to the airport. My new ‘Ear Hat’ to celebrate my accomplishment. My annual souvenir. 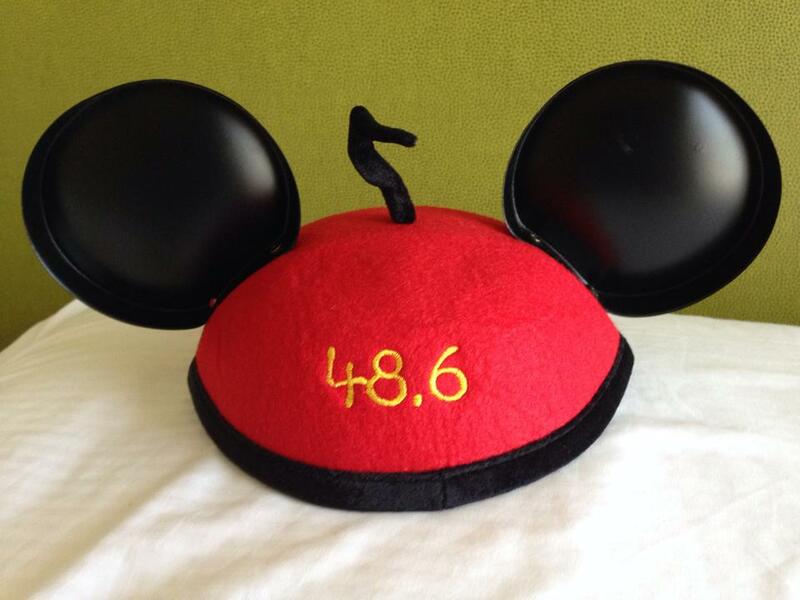 My ‘Ear Hat’ with my mileage. I spent the next few hours stretching my legs walking around EPCOT. 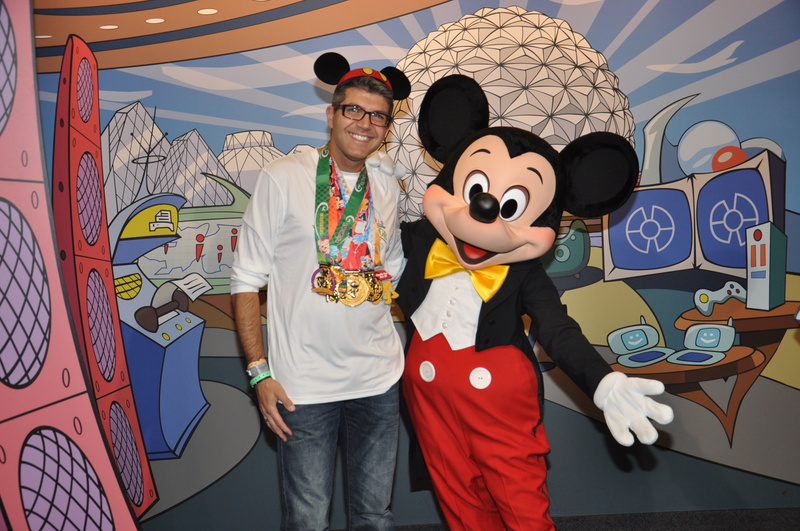 I went straight to Innoventions West to have my photos taken with Mickey, Goofy and Minnie with all my medals. 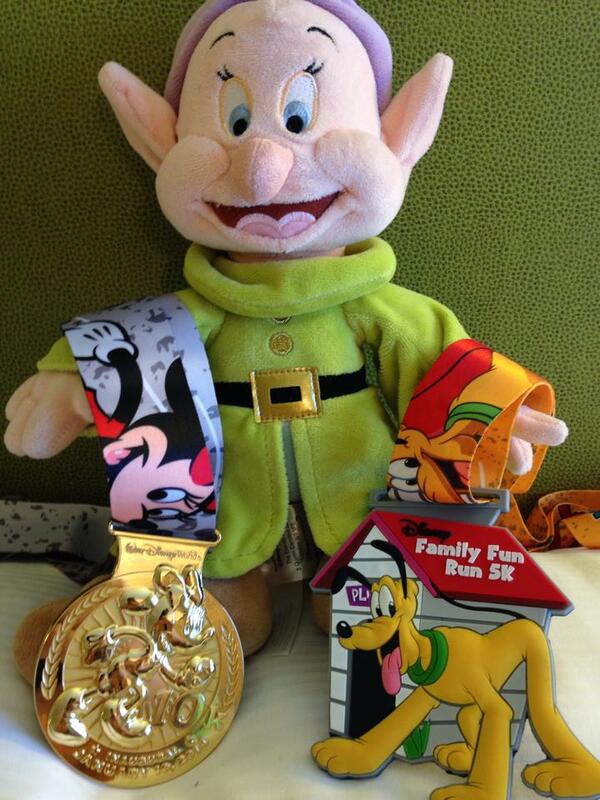 I walked around the park congratulating my fellow runners who were all proudly wearing their medals. 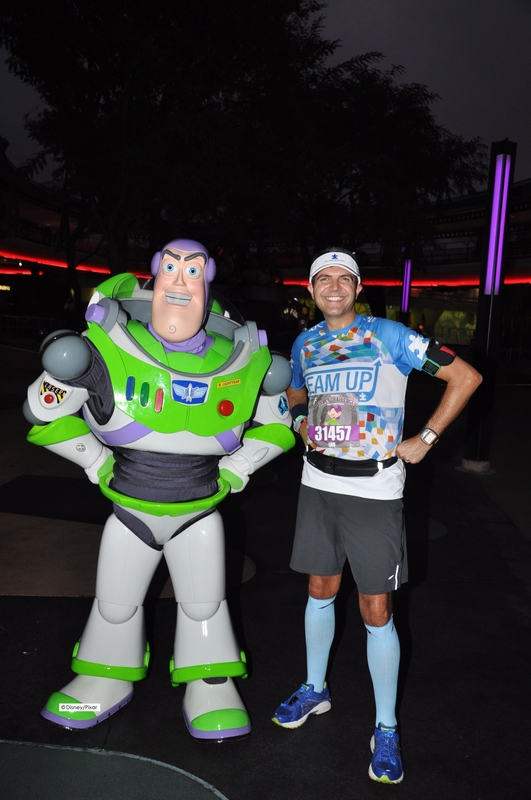 It is a great feeling of camaraderie which is really only experienced at a runDisney race. People hang around after the races and enjoy their post Marathon time. It feels great. Congratulations to all my fellow runners. 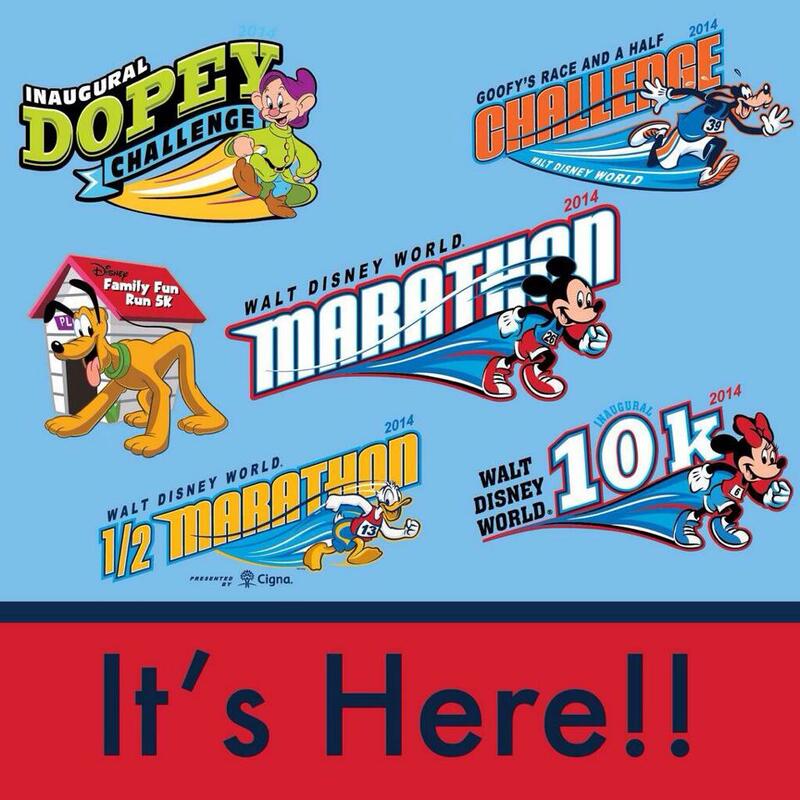 In summary, would I do the Dopey Challenge again? Not sure. I enjoyed it but I have done it now. 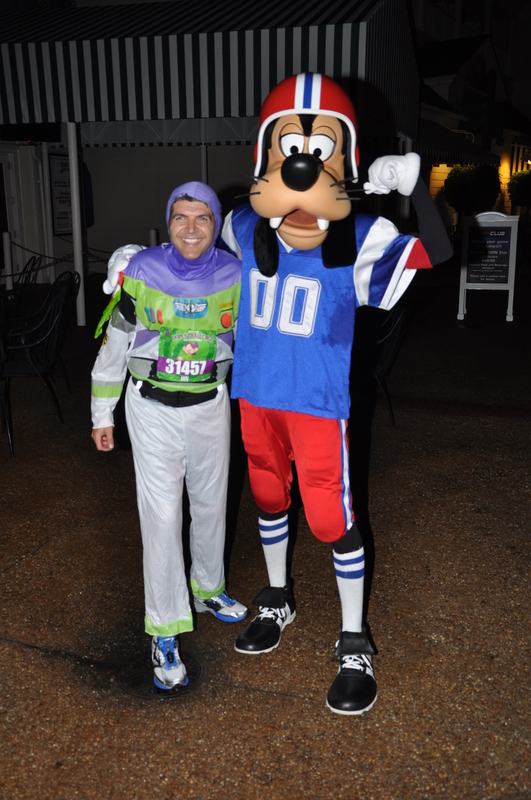 I’d love to run Goofy again as I really enjoy the atmosphere of the Half and the Full. 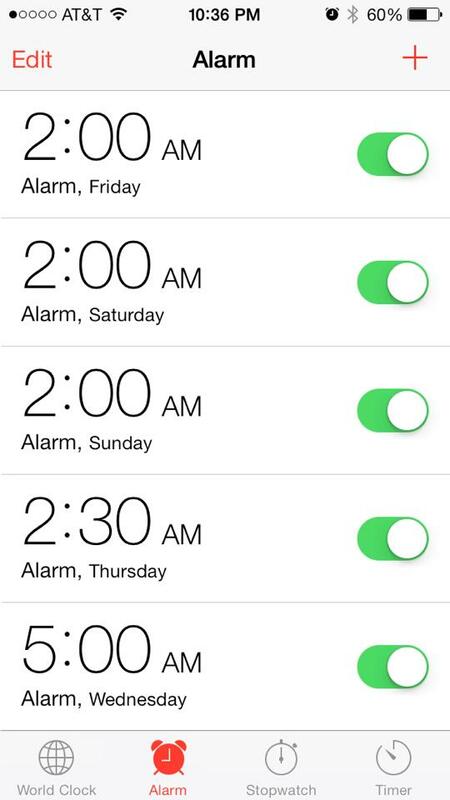 Racing on 4 consecutive days with 4 early wake ups and early nights was tough. 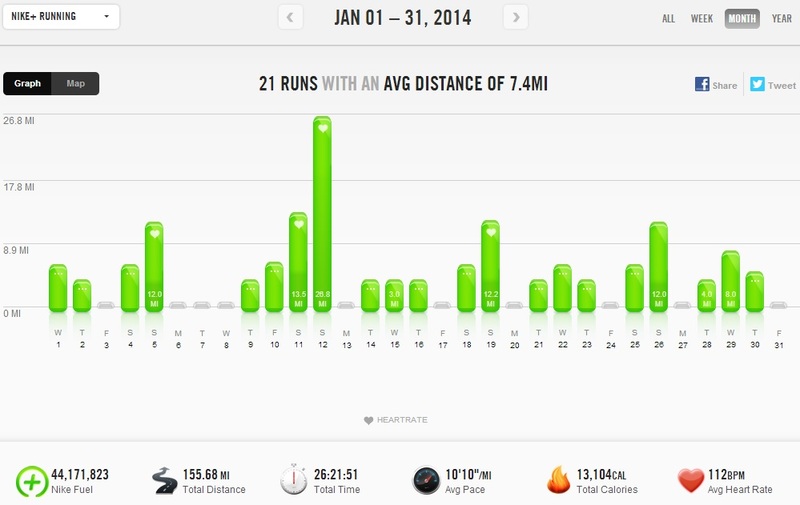 I travelled solo this year as 4 days of running would really have imposed on my family. I missed them greatly. This is the first year they haven’t been there for me at the finish and that is perhaps why I didn’t stick around too long once I finished. 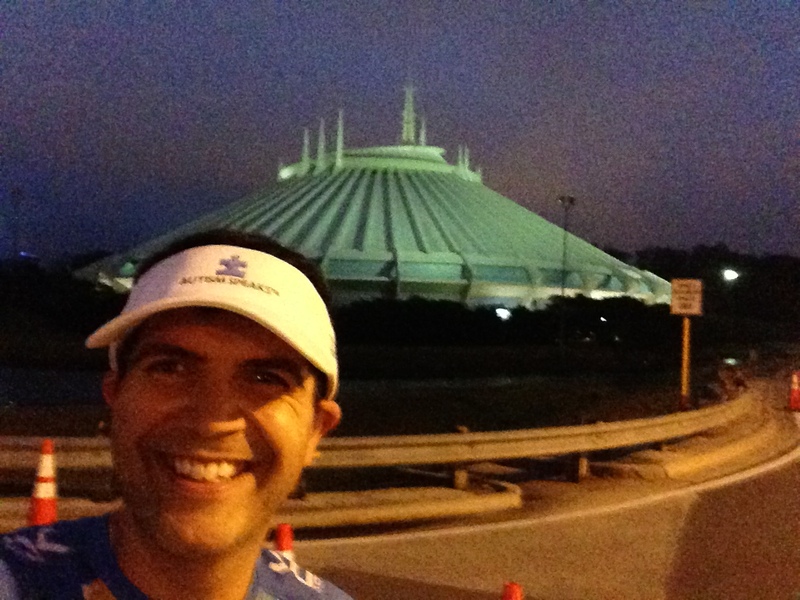 I love running at Disney and I love Disney Parks. It is better when my family is with me. That is probably my ultimate reason for not doing Dopey in the future for now (but never say never). What a great week. I met so many good friends this week and had a really special time running with everyone. 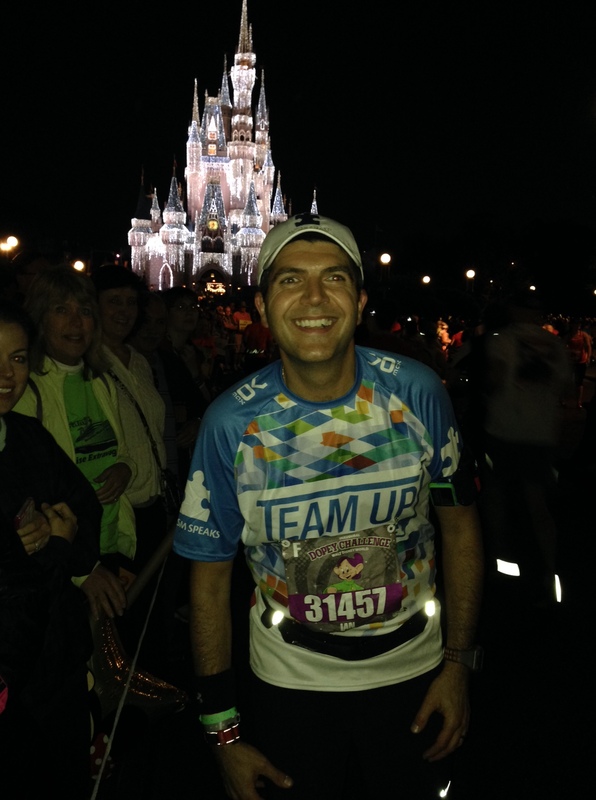 I want to thank runDisney, the volunteers and the cast members as well as my Team Up teammates and all my fellow runners for making this a week to remember. Thank you for sticking with me through what has been a ‘marathon’ recap. 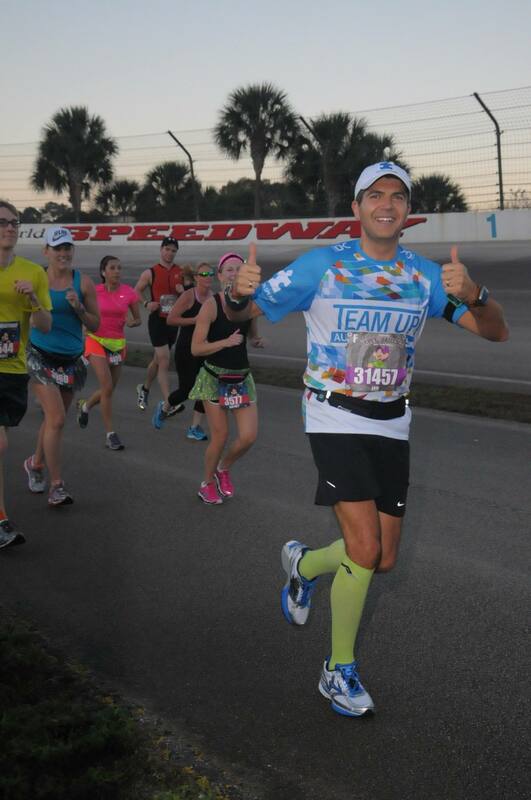 I hope you got a sense of how much fun I had during the Marathon and the whole weeks events. Wake up number 3 for race number 3. I did actually feel like I needed to use the foam roller to get my eyes open today. Nevertheless I was up thanks to my 2 alarms and hotel wake up call and got up and dressed into my ‘Team Up’ gear. 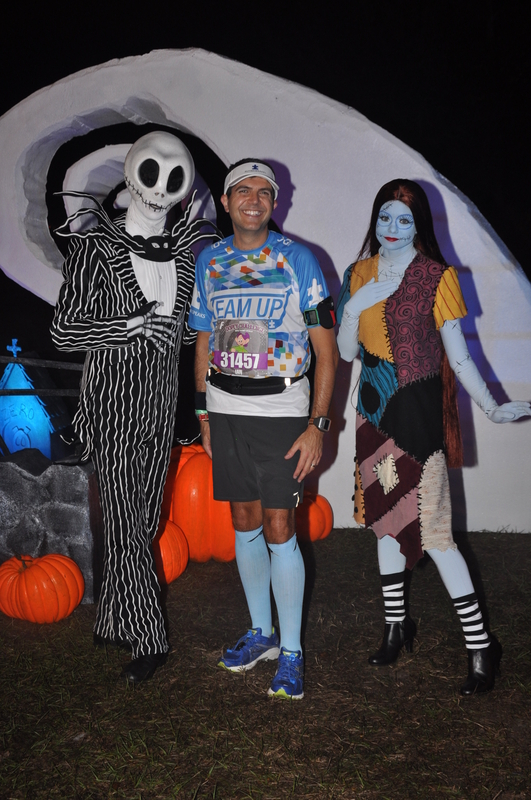 Today the closest I was going to get to a costume was my Pro Compression Marathon Socks were coordinated with my ‘Team Up’ colors. No more costumes this weekend. Looking at the forecast the day before there was a chance of rain and runDisney had already posted a heat advisory for the weekend. We would just have to wait and see how this would impact today. The goal was to take it easy so there was enough left in the tank for tomorrow’s marathon. Bright and early again at EPCOT. Look at the temperature!!! Again I arrived early at EPCOT and as you can see from the photograph above it was already quite warm. 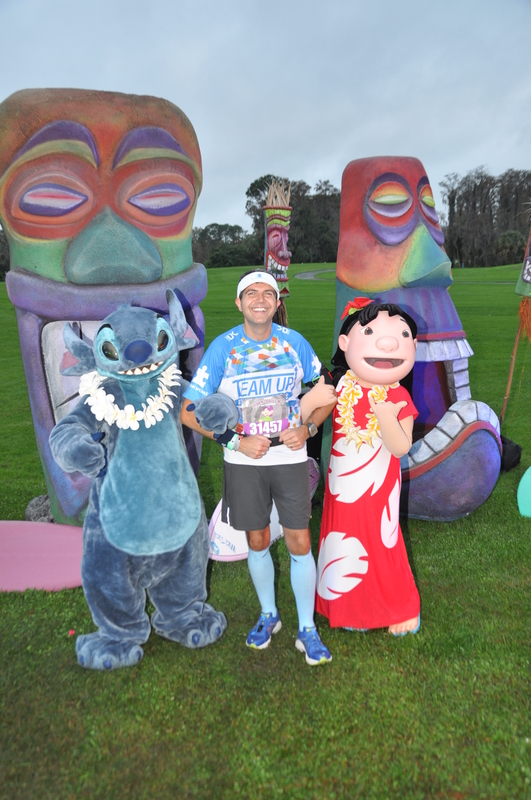 I headed over to the entrance to the ‘Race Retreat’ for today’s Team #runDisney meet up and after a quick photograph with the group I headed through bag check. I was definitely earlier than I had planned but I recalled last year’s Half Marathon where it was absolutely jammed getting to the corrals. 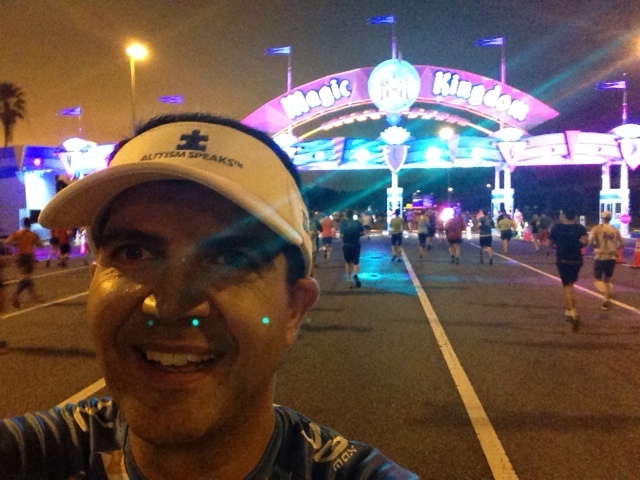 This year was a little different as runDisney had reduced the number of runners which made it easier getting to the corrals. 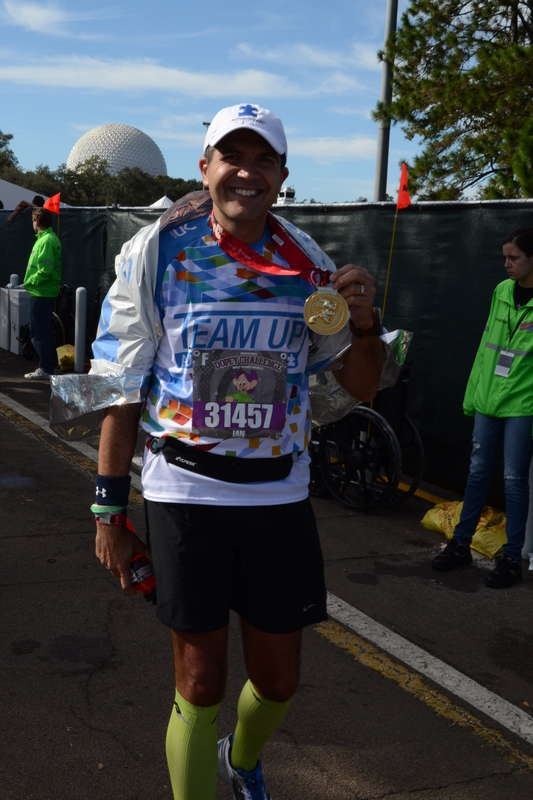 As I was walking to the corrals I started chatting with folks around me and bumped into Mark who was also running for Team Up. I didn’t have the opportunity to meet him the previous night so we chatted all the way to our corrals (we were both in corral F). Chatting away with someone is a very good way to relax before the start of a race. Mark and I grabbed space in the corral and sat down waiting for the start. Getting there early allowed us to have enough space to sit and get off our feet. Incidentally the speakers around our corral were not working so although we couldn’t hear all the excitement of the pre-show we were able to sit and have a nice chat. Donald waiting to give us the word. 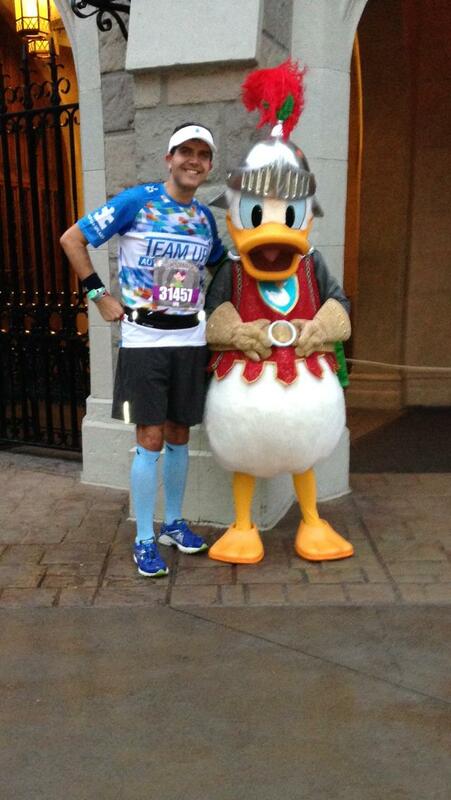 So we were called to the start line…Donald counted us down…3…2…1…GO!!!!!! Wait…what happened? Where were the fireworks? No fireworks? Really? That’s why I’m here? Can I get a refund? What? So, no fireworks for our corral. A little disappointed I set off for the start of the race. Just past the start line on the left was Bart Yasso cheering on the runners who were part of the Runner’s World Challenge. Bart is a great guy and was friendly to all the runners passing by. Just as an aside, I ran the Philadelphia Marathon with the Runner’s World Challenge back in 2011 and would recommend the experience. Okay, back to the race. Due to the timing between corrals a couple of minutes later I heard fireworks. Yup, corral G got them 😦 , nevertheless I was on my way and looking forward to the day. As I approached the first mile marker I bumped into Kimberly from ‘Mother Maker Marathon Runner‘. Kimberly and I have been Facebook friends for a while but we had yet to actually meet up despite some attempts during the previous two days. Some of you may know Kimberly already but for those of you who don’t she is truly an inspiration. 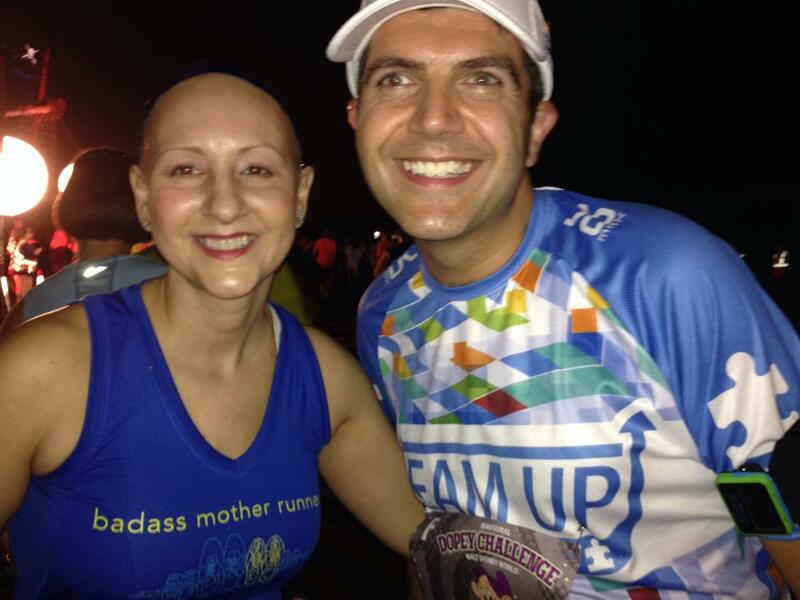 She is a cancer survivor and has continued running through her chemotherapy treatments. 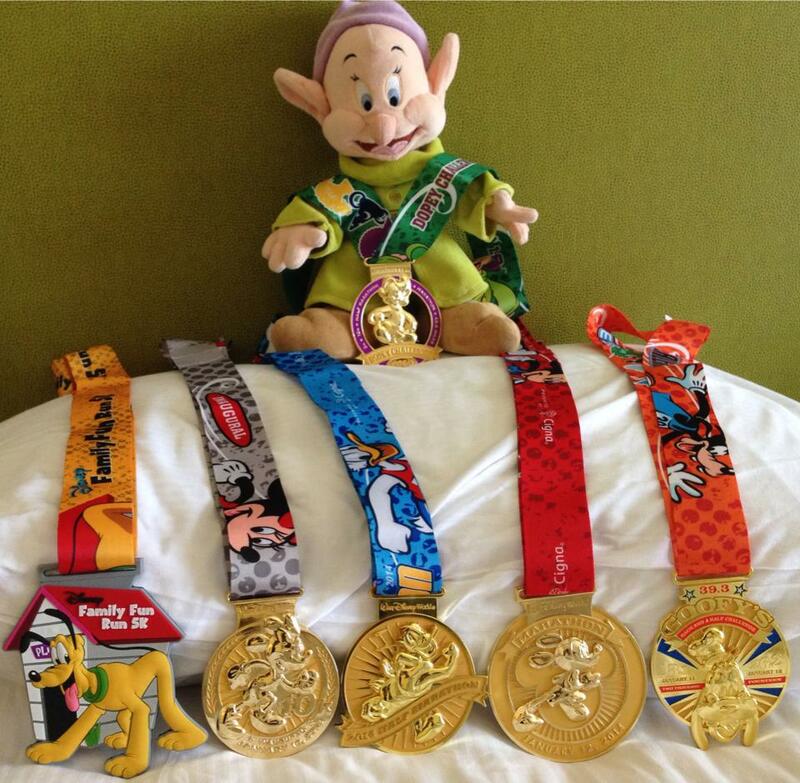 Since undergoing surgery and her treatments she has run the Dumbo Double Dare in Disneyland, the Chicago Marathon, the New York Marathon and was running the Dopey Challenge…and also was scheduled to run the Tinkerbell Half Marathon the week after the Dopey. Amazing. Meeting Kimberly was a great start to the day. 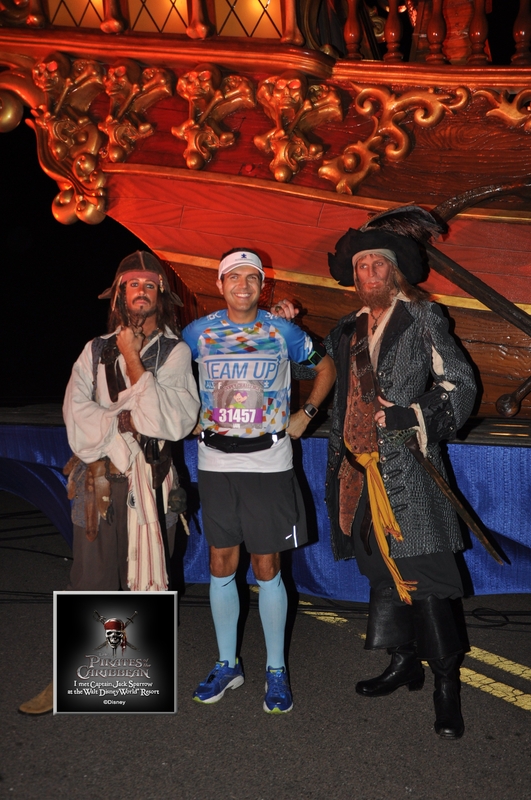 We chatted while standing in line to have our photo with Captain Jack Sparrow. I said my ‘so long for now’ and wished her luck and headed off for the Magic Kingdom. Heading through the main gates on our way to the Magic Kingdom. No charge for being on foot. I took the opportunity today to make stops at as many characters as I could with the plan on taking it easy and so that I could bypass the same photo stops during the Marathon. This worked out well as sometimes depending upon the time you arrive at a character stop there are different although related characters, for example Peter Pan and Wendy might swap out with Captain Hook and Mr Smee. Today gave me the opportunity should there be someone different there tomorrow. As always I tried to get the pictures of the characters that my sons will most want to see. With Jack and Sally. Both my boys love ‘The Nightmare Before Christmas’. As you pass through the Ticket and Transportation Center you start to approach the Magic Kingdom. First you pass ‘under’ ‘Bay Lake’ via a small underpass and them run alongside the ‘Contemporary Resort’, round the back of ‘Space Mountain’ and then enter ‘Main Street USA’ just past ‘Town Square’. My very favorite part about running at Walt Disney World comes when you enter the Magic Kingdom and you run up ‘Main Street USA’. This is truly one of the most unique opportunities in the most special of locations that I can think of. 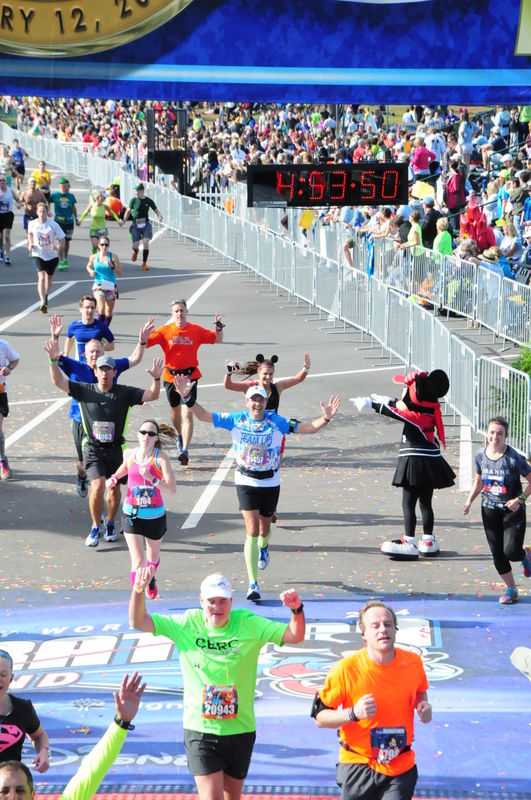 As a self-confessed ‘Disney Head’ I admit that I absolutely love this part of the race and it wouldn’t matter to me if it was mile 1, mile 6 or mile 20 (although it would be cool if it was mile 26.2!!!) This was the 4th time I had experienced this and it was still as ‘magical’. The crowds line the street left and right, the street is all lit up and Cinderella’s Castle is all aglow just in the distance. You cannot beat it for atmosphere. As you can see from my pictures, I’m in my element here. 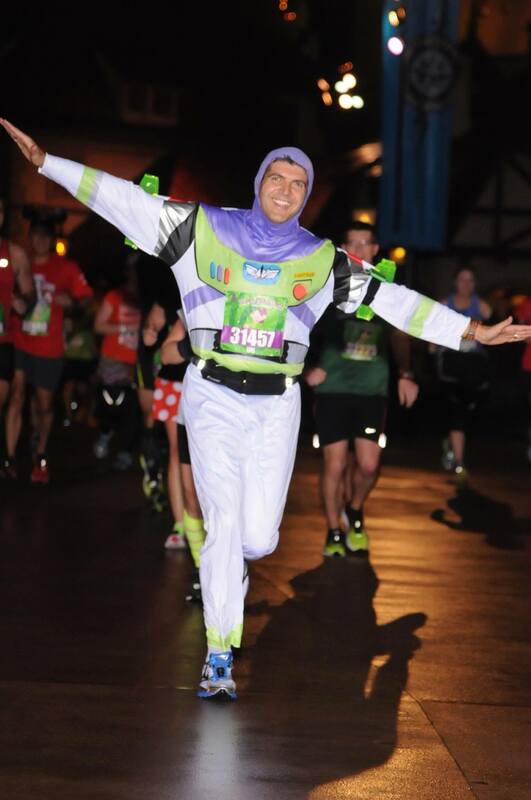 You don’t spend too much time on Main Street but you run up and make a right turn into ‘Tomorrow Land’ where I encountered the real ‘Buzz Lightyear’ as compared to my fake Buzz from the 10K. This was the first of three character stops in a row where just as I ran up to have my photo taken the character went inside for a quick break (I assumed Buzz had to re-energize his fuel cells, Pooh Bear needed a quick shot of honey and Daisy Duck had to re-arrange her feathers). However, all was well despite this becoming a ’19 minute mile’ that included these character stops. Then comes another fun part of the race which is running through the Castle and the chance for a great photo opportunity in front. Hey, look where I am!!! After running through the Castle we make our way out of the park through Liberty Square and Frontierland and then backstage out onto Floridian Way (a.k.a. ‘Cone Alley’). 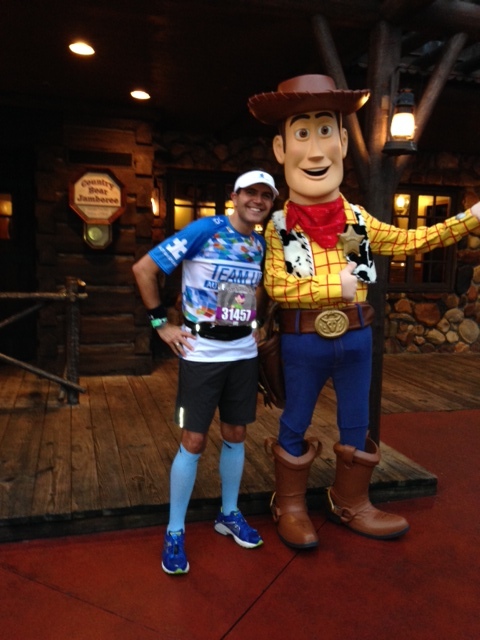 I took one more character stop to have a photograph with Woody on the way out of the park. At this point in the race the sun had started to rise although it wasn’t what I would call sunny. I guess daylight is a better way of saying it. Thankfully there was cloud cover as it was already warm and very humid at this point however once we left the park a cool breeze was blowing which made the run a little more comfortable. It as at this stage that I always look forward to seeing Mary Poppins as she is usually located just outside of the Grand Floridian. However this year she was not there (on either day). I later learned that she was with Bert and the Penguins in the Race Retreat tent on both days. So I settled in and with the exception of a few character stops maintained an even pace from here on out until we started to approach the overpass that would lead us to EPCOT. 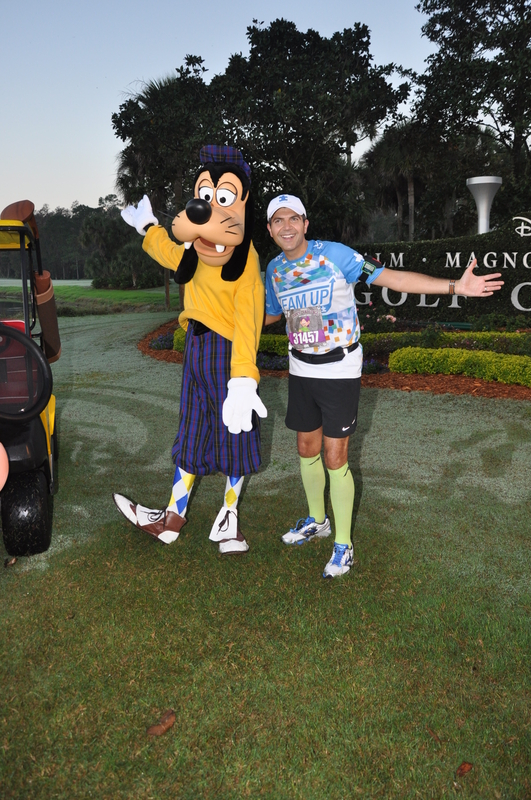 There is not too much to see on this part of the course as it is basically a retread of the route to EPCOT from the other side of the Magic Kingdom but it does give opportunities for some character stops. This year however those were few and far between on the way back. Generally I noticed less characters out on the course than in prior years. 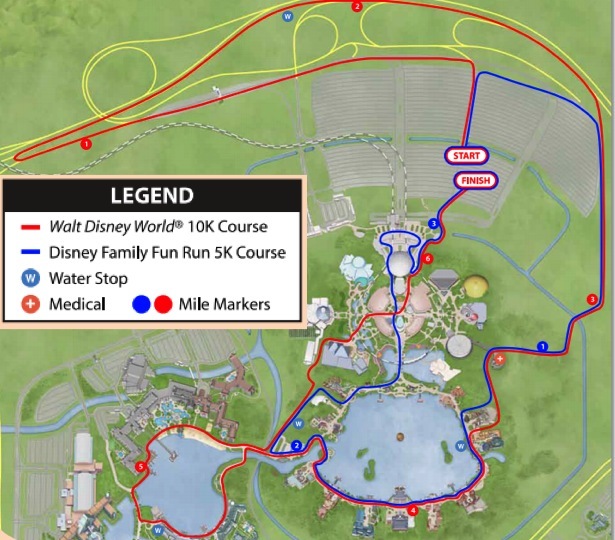 That may well have been part of runDisney’s plan to help get foot traffic flowing along with reducing the number of runners and the changes to the spacing of the corrals. There are a series of rolling hills (this is Florida…don’t get the wrong idea…they are still pretty flat) as you make your way back to EPCOT. While running towards the overpass along World Drive I heard my name being called and turned to find Jonathan who started with me in the 10K the day before. We had a little chat during my walk break and then parted ways as I began to run again. He looked to be having as good a time as I was so that was great to see. Once you have gone around the ramp up to the overpass you are only a couple of miles out and as you cross over the overpass you can see the sea of runners coming up behind you. 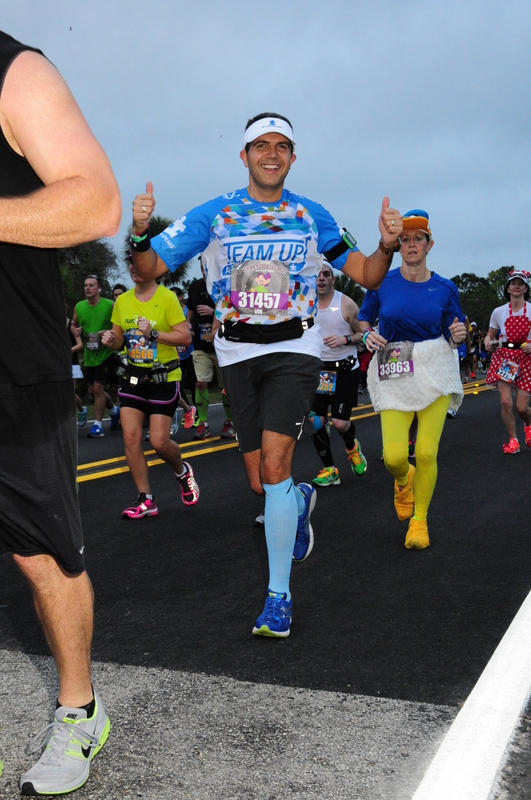 It is a pretty cool sight to see so many of your fellow runners out there and is encouragement to know that you are within a couple of miles from the finish line. It was at this time that I ran alongside Sid Busch (who I actually had lunch plans with that day). 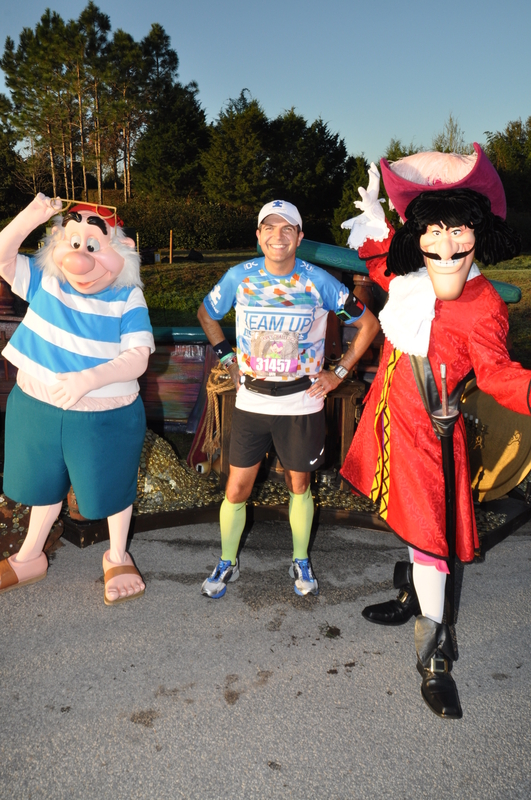 Sid has run 19 of the 20 Disney Marathons and is ‘Perfectly Goofy’. He was out here running the Dopey. 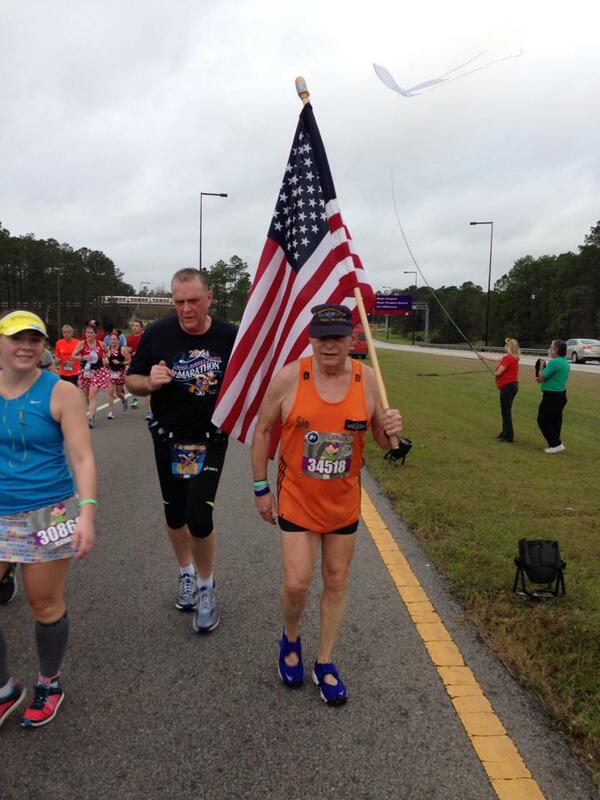 Sid is a retired naval officer and runs carrying the American Flag in support of our Armed Forces and runs in memory of fallen soldiers. 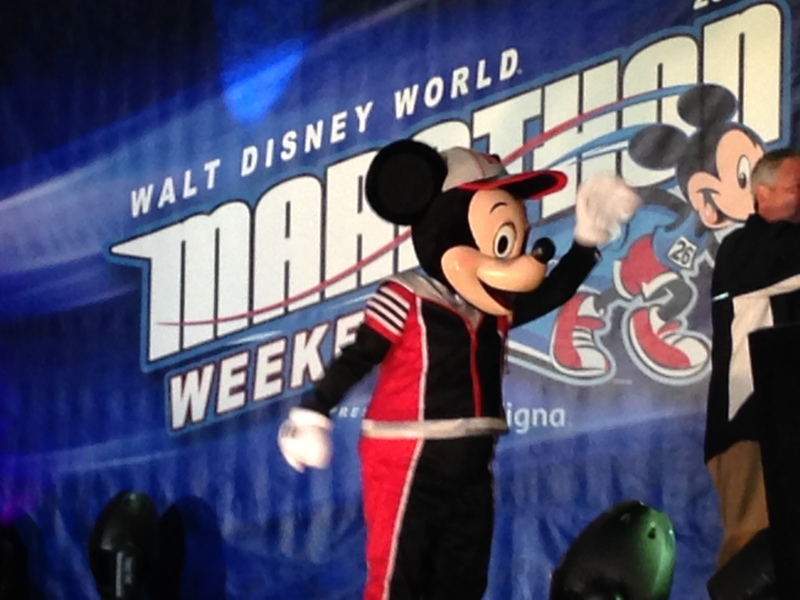 He is kind of famous out here at the Walt Disney World Marathon (and other races too). He was looking good. Great to see Sid out there on the course. Getting lots of crowd and runner support for all his good work. There is a sharp right turn at mile 11.5 and that leads you straight towards EPCOT. Once you have made the turn you can see the park and you know you are close to the finish. 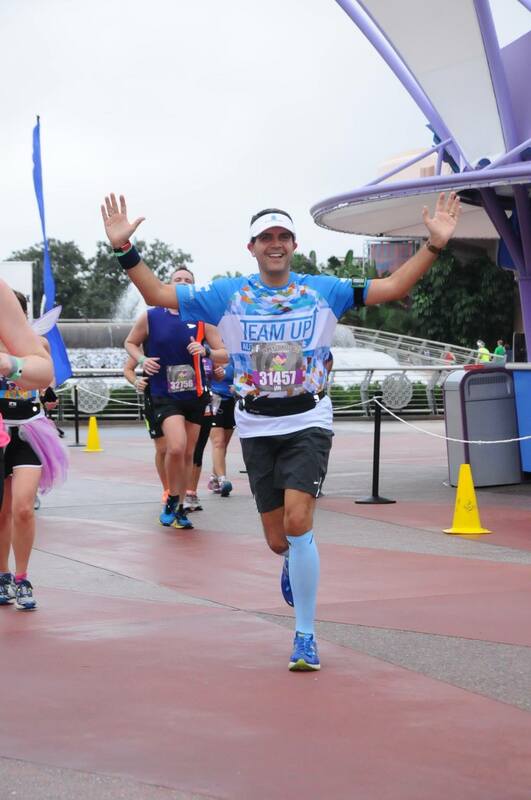 From there on in you run through Future World and out towards the finish line. As you can see from the photos I was enjoying myself alot. Actually I felt much better than at this point the year before where I almost had injured myself ‘racing’ to the finish line. I took it nice and easy this year. Experience shows. 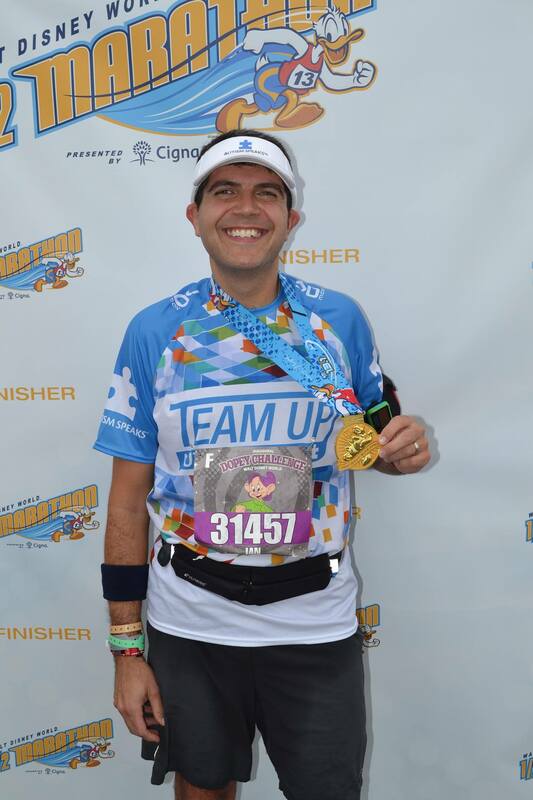 I made it through the finish line with a chip time of 2:43:54. Not fast by any means but considering my goal of taking it easy and all the character stops (including the ‘disappearing’ characters in the Magic Kingdom) I wasn’t too disappointed with my time. 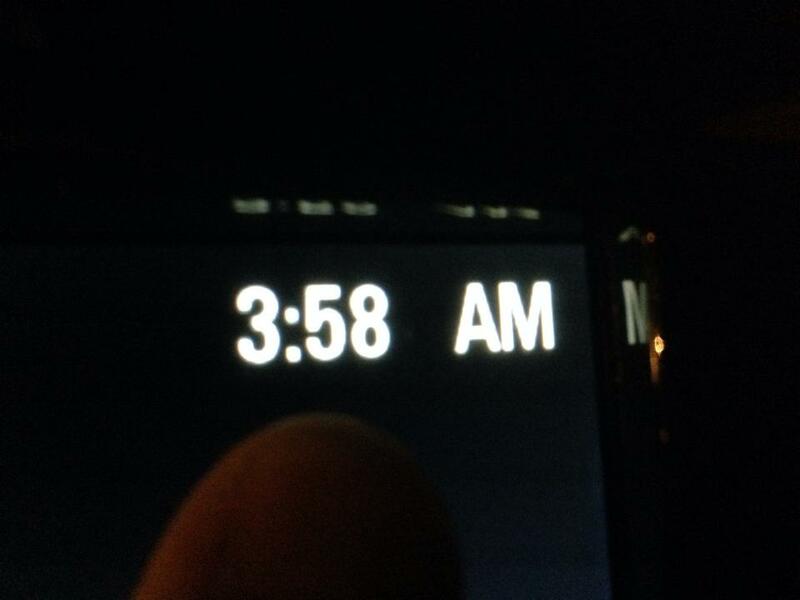 I had said to myself at the start that anything around 2:30 would be fine. 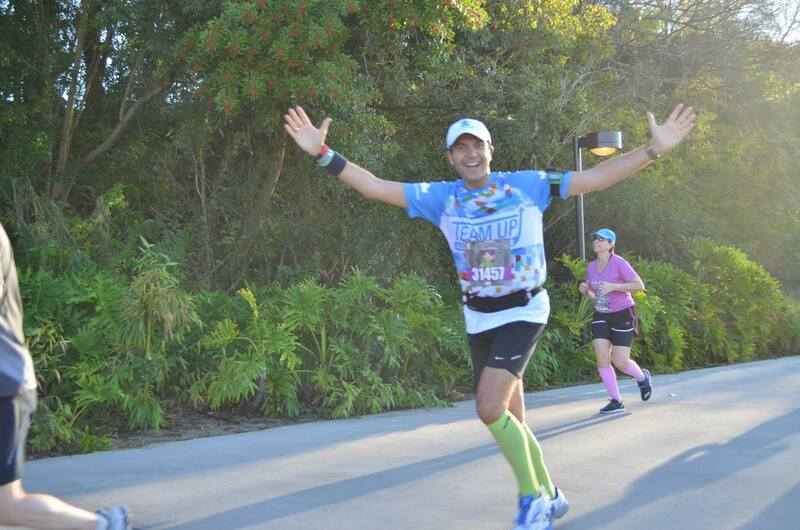 WIth 26.2 miles to run the next day I was feeling good and that was what counted. I got my medal and headed over to the to the self-treatment area to ice down my legs. As I was travelling solo this year I had actually taken a studio apartment rather than a one bedroom like usual which meant that there was a shower but no bath tub where I would have soaked in cool iced water. 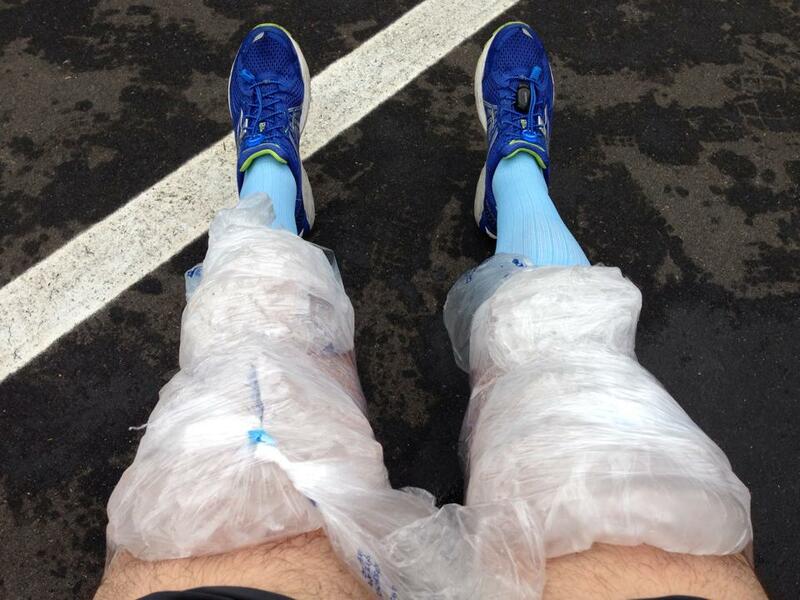 I took extra time at the self-treatment area to ice down my quads, hamstrings, knees and calf muscles. I looked a sight for sore eyes. I have to thank the folks from the medical team for volunteering and for wrapping me up in ice and clear wrap. It may not look good but it did the trick. 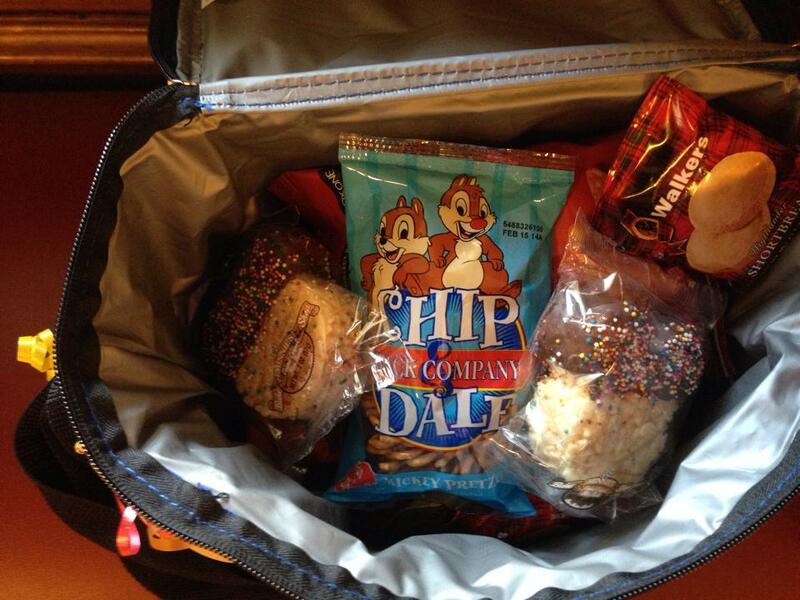 I then made my way out to the bag check and headed back home to shower up for my lunch reservation in the Magic Kingdom. 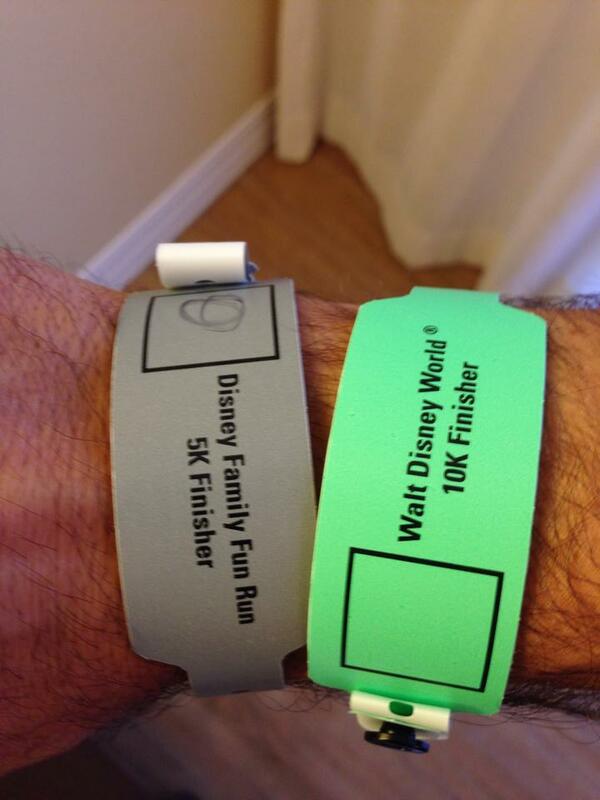 Again, the wrist band process was much better today as it had been at the 10K even with the added runners who were participating in the Goofy Challenge. So now I was adding to both my bracelet and medal haul. Not bad for three days. 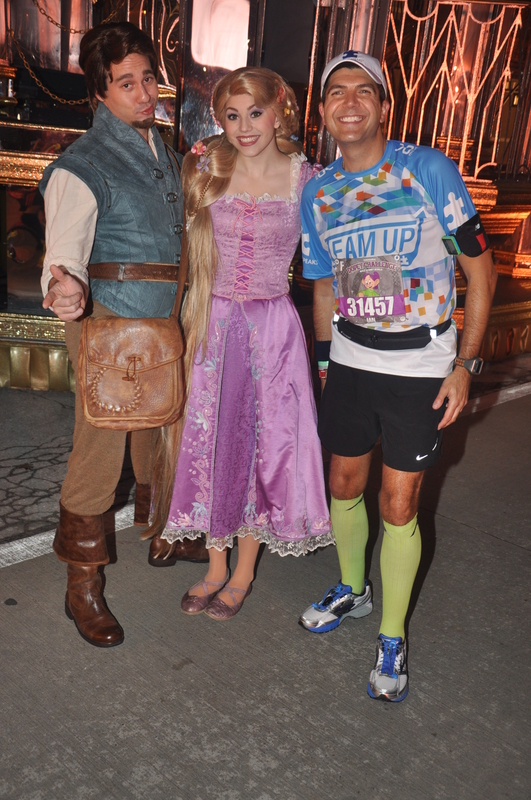 So after a quick shower I headed back to the Magic Kingdom for lunch (at ‘The Crystal Palace’) with Sid and new friends Rob and MaryJane where we chatted for almost 2 hours and refueled before the Marathon on Sunday. After we said our goodbyes I spent the rest of the day in the Magic Kingdom. I had a checklist of rides and attractions that I wanted to hit that I had planned would be a little restful (i.e. off my feet) before watching the ‘Main Street Electrical Parade’ and heading off home for another relatively early night. I was getting a bit tired around 6pm and headed to my last attraction (the ‘Carousel of Progress’) and had actually decided to skip the Electrical Parade and head home early. It’s not like I haven’t seen it a few times 🙂 Well, what a good choice that was. As soon as I was back at the Transport and Ticket Center the heavens opened up. Rain was steadily coming down and I was driving home through a lightning storm that lasted a decent amount of time. 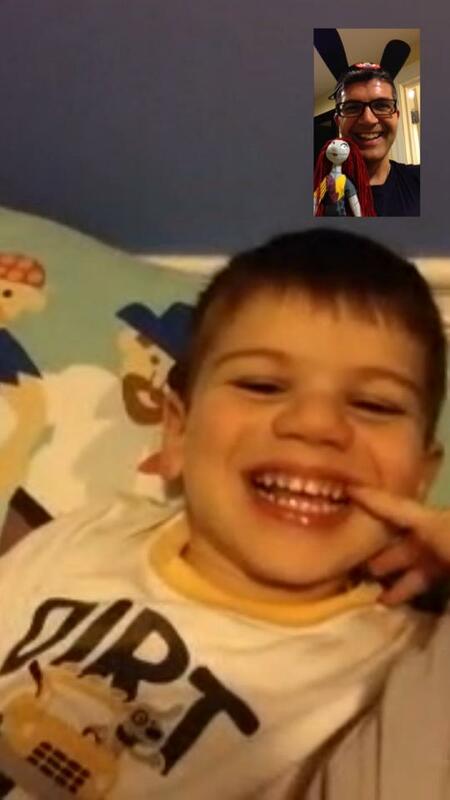 Getting home early gave me the chance to also FaceTime with my family. 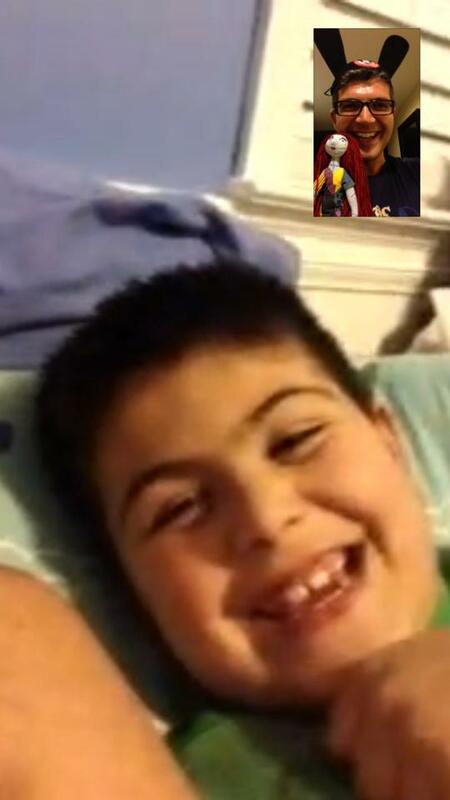 I got to show them some of the gifts I had bought for them and also read books to them in bed. It was great. The boys seemed very pleased with my purchases. I think they even missed me while I was gone. I got my gear ready for the next morning and headed off to bed. My Fitbit stats for the day? Well, considering I had run a Half Marathon (13.1 miles) I racked up a total of 21.27 miles. Again, how that would play out the next day was anyones guess. With that I turn out the lights and tried to get some sleep knowing that in a few hours the main event was going to be here. 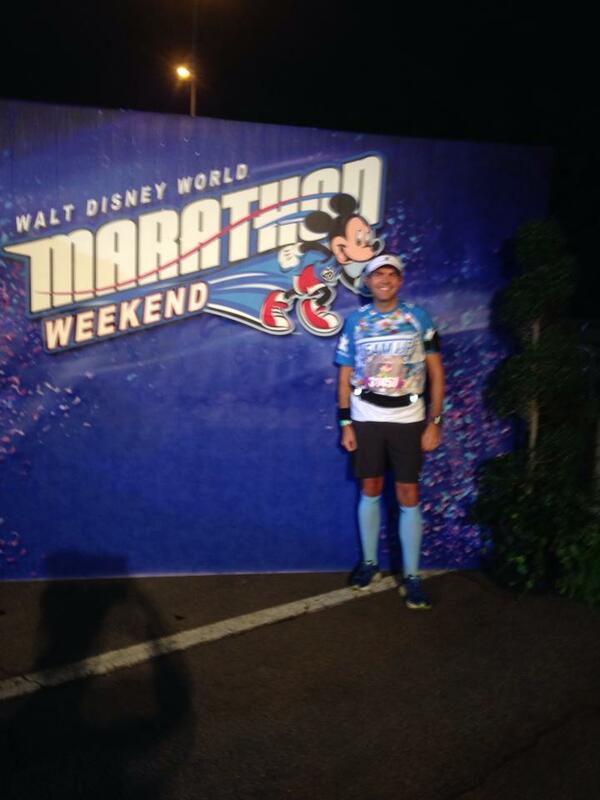 After a reasonably early night (reasonable for Disney park visits) I woke up early for the 10K. 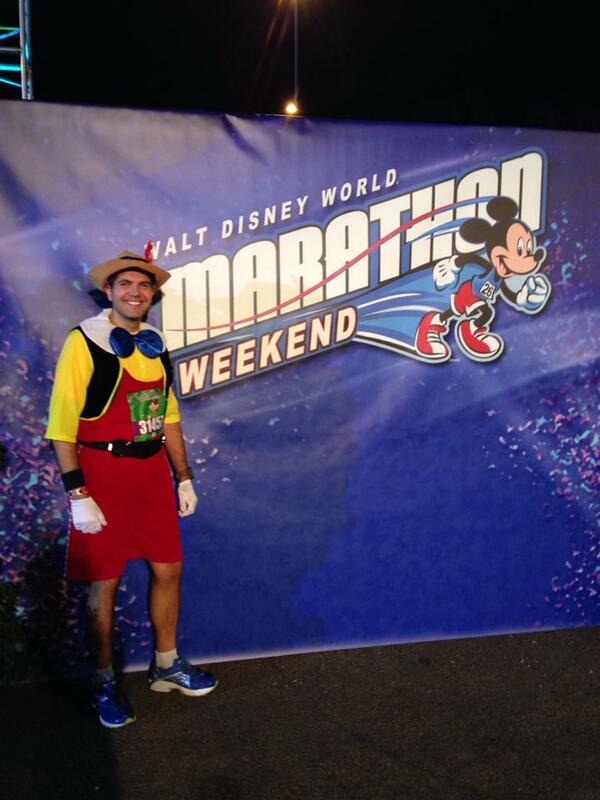 Race day number 2 and the debut of another Disney themed costume. 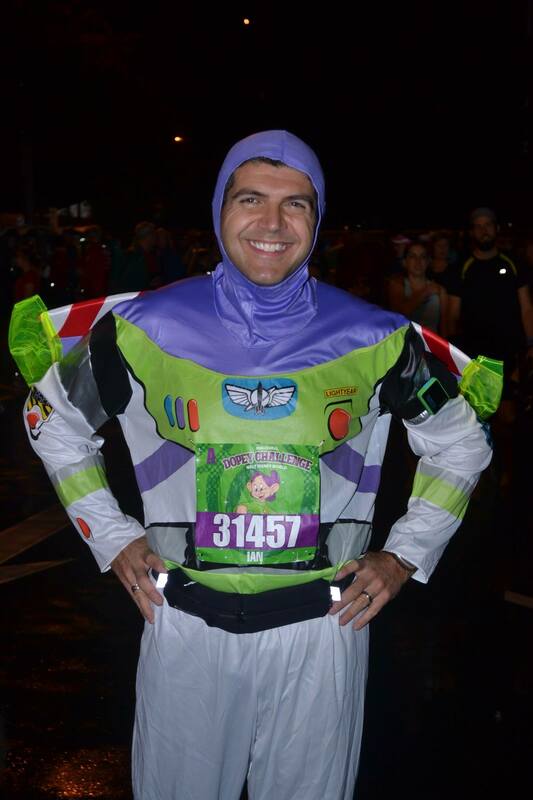 Today I would be running as ‘Buzz Lightyear’ and hoping that running with a jetpack wouldn’t be as annoying as I thought it might be. 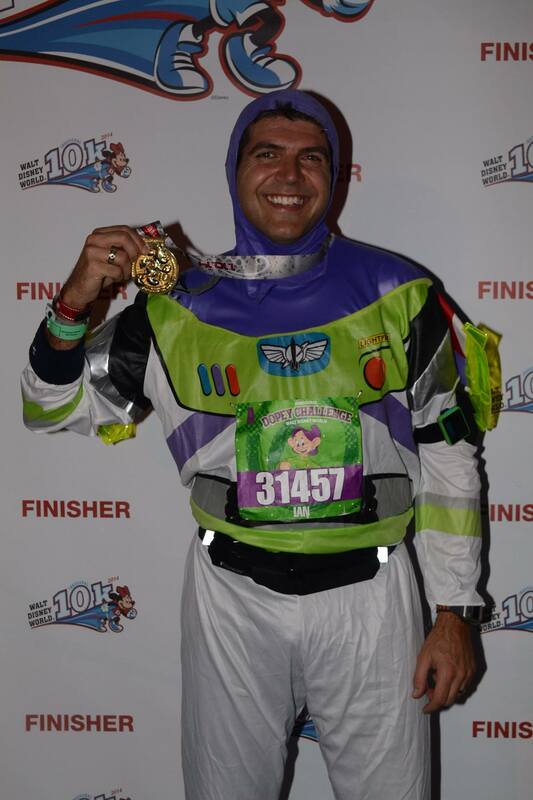 So I climbed into my one piece Buzz body suit (developing an irrational fear of needing to go to the bathroom during a race) stuck on my jetpack and headed to the elevators hoping that no one would actually see me and headed to EPCOT for day 2 of the Dopey Challenge and the inaugural ‘Minnie’ 10K. Earlier than the day before but somehow I am still awake. Upon arrival at EPCOT I headed over again to the bag check area hoping that today I would be in the right place at the right time for the Team #runDisney meet up. I got there a little early and not many people were there at the time, at least not where the meet up was to occur. Having second thoughts about the jetpack attached to my back I walked up to a complete stranger and asked her if she wouldn’t mind taking some safety pins and pinning my jetpack on me. 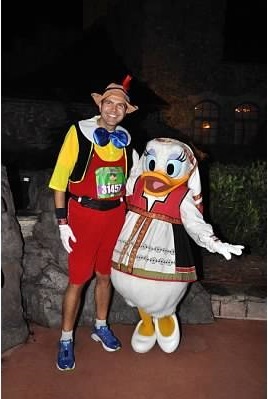 The things you can only get away with at a runDisney race. Having taken a couple of towels from the hotel to I made a place to sit down outside the race retreat and waited for folks to turn up for the meet. Today I was in the right place and folks started turning up. I met Marc (who makes those great slide shows for the Team #runDisney Facebook page) and Greg from ‘Why I Run Disney‘ and his wife Brooke, Megan from ‘Running Toward The Prize‘ (also the co-author of ‘Magical Miles: The Runner’s Guide to Walt Disney World‘) and her husband and Matt from ‘Dad’s Got The Runs‘ who is also the Team #runDisney page administrator. A nice bunch of folks to meet. After the photo I headed to the corrals and again met my fellow Autism Speaks team-mate Rob and also Jonathan who I help administrate the ‘Goofy Challenge 2014’ Facebook group. Again, I was easy to spot today. 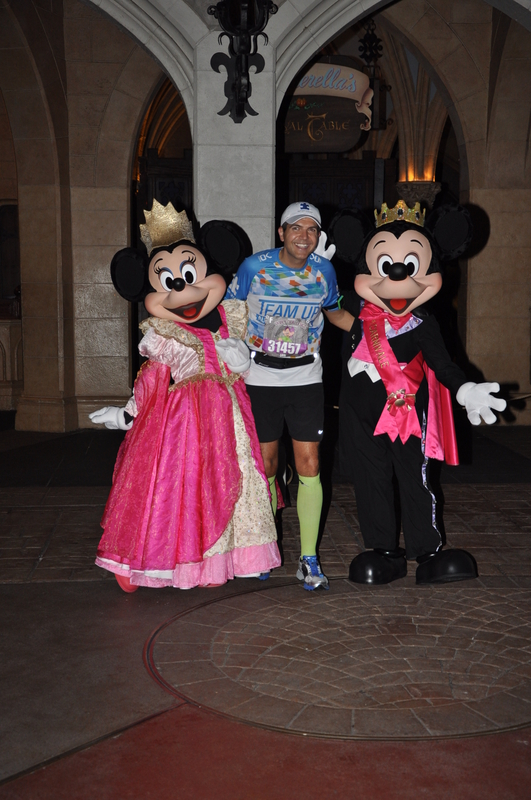 Minnie was there at the start line to get us going and counted us down to the fireworks. Once we were given the word to go we headed out onto this new 10K course. I didn’t quite know what to expect as I really could not picture from the map how the course would turn out. I knew there would be an out and back and thought there would be a repeat of the 5K course but that’s pretty much it, so here is my recap. Firstly, running with a jetpack takes time to get used to. At first the flapping was getting a bit annoying and I was going slow so as not to aggravate the situation but I soon settled in to the rhythm and the fun began. 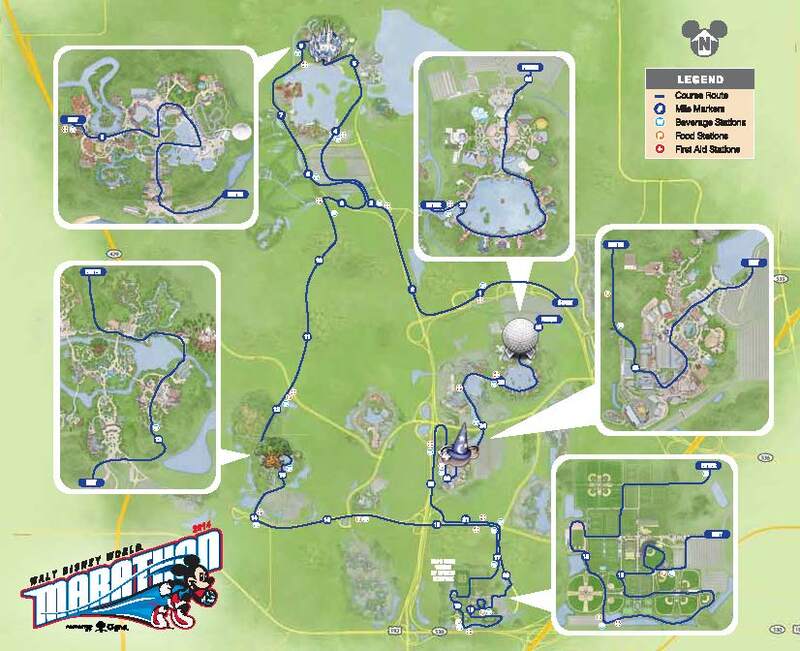 The first two miles of the course were an out and back from the EPCOT parking lot to the back of World Showcase. I didn’t mind the out and back but I heard complaints from others that it was a bit boring and that they did not like the hairpin turn which lead to in incline. I probably didn’t notice this too much as I had decided to stop for a character photo opportunity just after the turn. I also stopped as it was very warm and humid that morning and I hadn’t helped the situation by dressing in a polyester jumpsuit. At the character stop I bumped into these two fine gentlemen from Saskatchewan, Canada dressing (for both the 5K and 10K) as Dopey and Grumpy. Awesome costumes although they admitted that they were a bit warm. 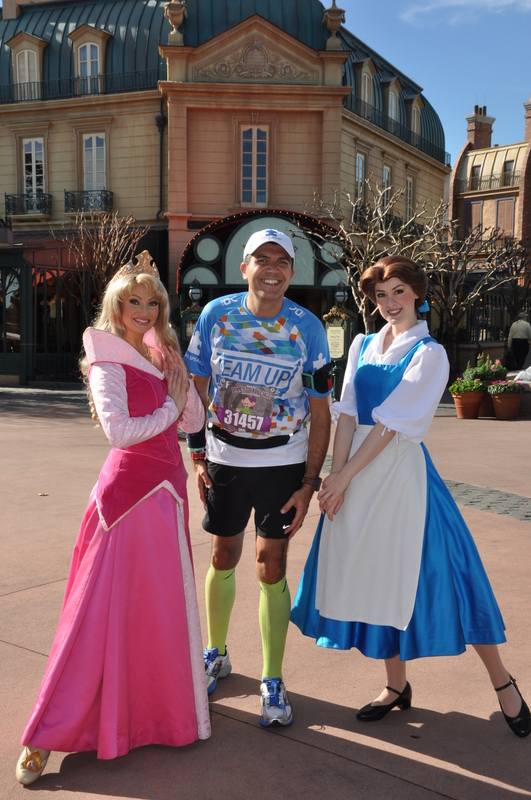 They were running the Dopey and said they planned (like me) to run the first two days in costume. They also told me as it -50 degrees back home they hadn’t really trained this year but as past Goofy runners they were relying on ‘experience’. I am not sure what happened over the course of the weekend but I hope they had fun and finished. There was not much to see during the second mile back towards EPCOT except for a giant TV screen showing Minnie cartoons set to modern music. It would have been nice to have had another character out there during that stretch. 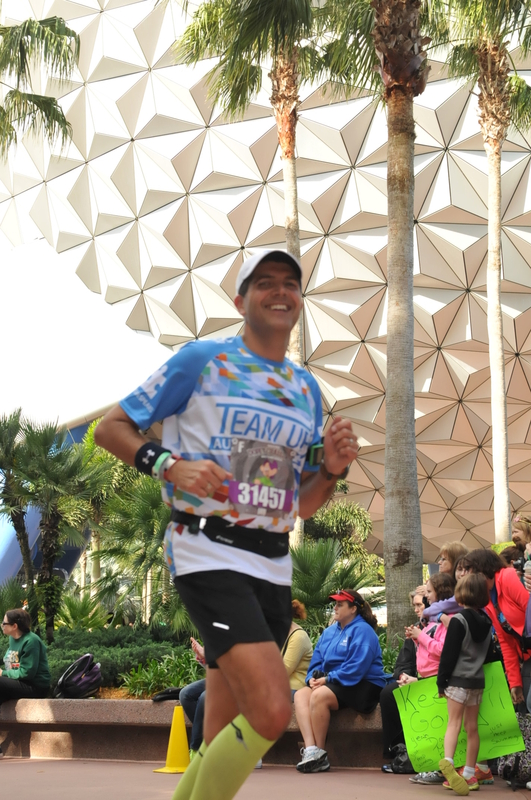 Once back into EPCOT I assumed we would follow the same course that we had for the 5K the previous day but had we done that our course would have been about 5 miles so I was interested to see how we would get that extra mile in. As we made our way around World Showcase we took a turn out of the park just after the France Pavillion through the ‘International Gateway’ which took us on a loop around the Boardwalk past the Yacht and Beach Clubs and then back into EPCOT via the United Kingdom Pavillion. From there it was back to the finish line but going through Innoventions West and then to the finish line area rather than a circle around Spaceship Earth as we had in the 5K the day before. I really enjoyed my time on the Boardwalk. I had only ever run this partially as part of the Marathon course and today, even at this early hour, there were crowds out there to cheer everyone on. 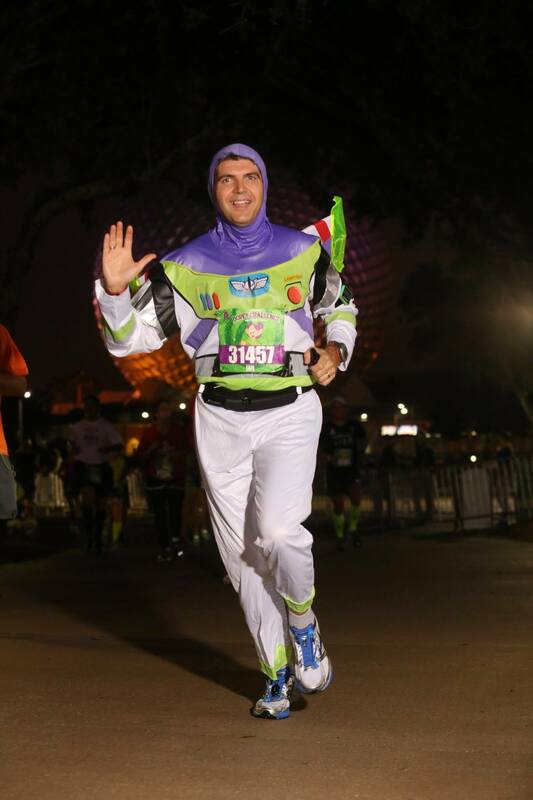 They had characters out on the Boardwalk and that allowed me to cool down during the last couple of miles as I was beginning to get warmer and warmer dressed as Buzz (consideration of costumes will be given greater scrutiny next time). Due to the humidity and warm weather the Boardwalk was pretty damp which also caused me to run a little slower as I didn’t want to slip and get hurt with two more races to go. As you can see from the pictures I really had fun out there. You can also see from the ground how wet underfoot it was. There were plenty of folks out there cheering for Buzz. Many shouts of ‘To Infinity And Beyond’ were being traded back and forth. I was having a blast out there. As I rounded the corner to the finish line I heard someone call my name and was pleased to see Rhonda who I had met the day earlier. Again, I was easy to spot in costume. We took a quick photo together and headed on to the finish. 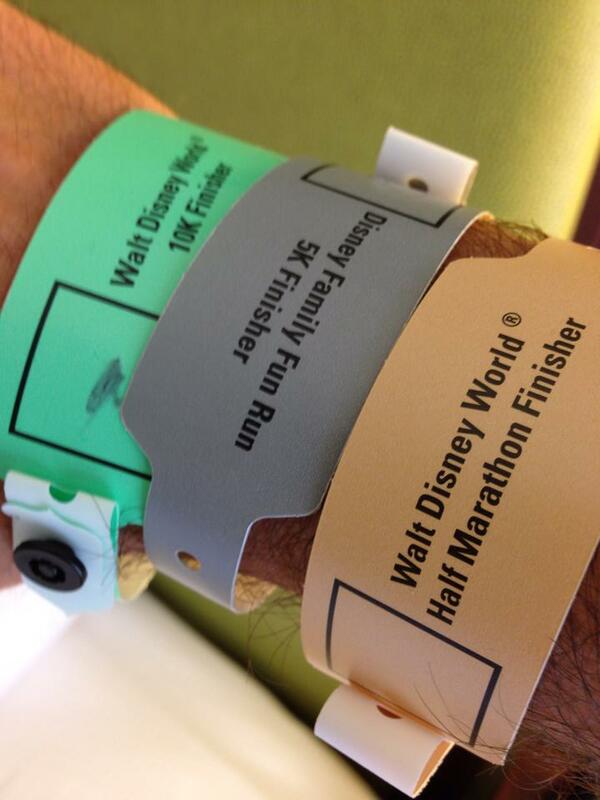 Heading through the finish line area to pick up my second wrist band today was much smoother. This time they had set up aisles to pass through where at the front a volunteer marked your 5K band with a Sharpie and a second volunteer at the end of the aisle put on your 10K finisher band. So now I had two wristbands and two medals. I was building quite a collection of memories so far. After a quick shower I headed back out to spend a day at EPCOT where for the first time (despite many visits to EPCOT) I rode the following attractions: ‘Soarin”, ‘Test Track’ and the ‘Gran Fiesta Tour Starring the Three Caballeros’ as well as seeing for the first time: ‘Captain EO’, ‘Ellen’s Energy Adventure’ and ‘The Circle Of Life’. Talk about keeping myself busy without the family in tow. I spent the day in EPCOT as that evening there was the Team Up with Autism Speaks team dinner being hosted at ‘The Living Seas’. This was a really cool private dining area behind the aquarium in ‘The Seas with Nemo and Friends’. 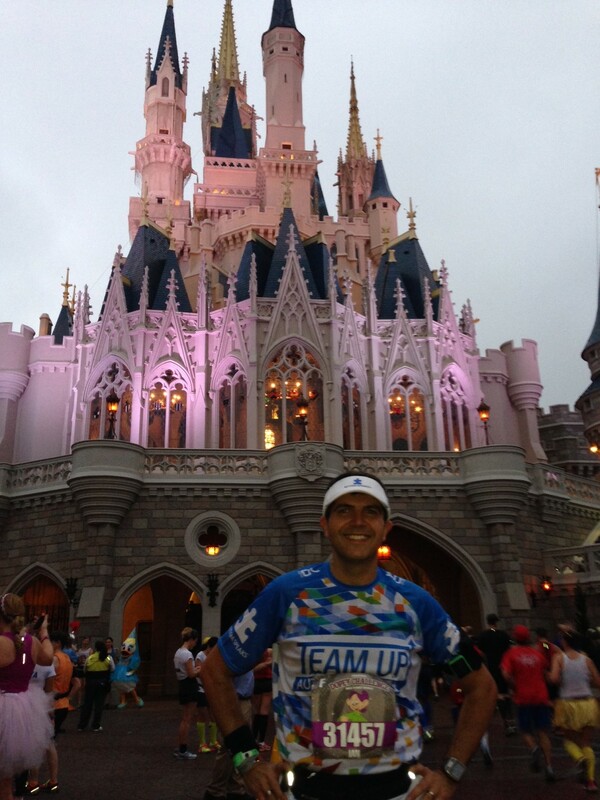 At the dinner that night I sat with Rob and his family and got to meet up with other Team Up runners. 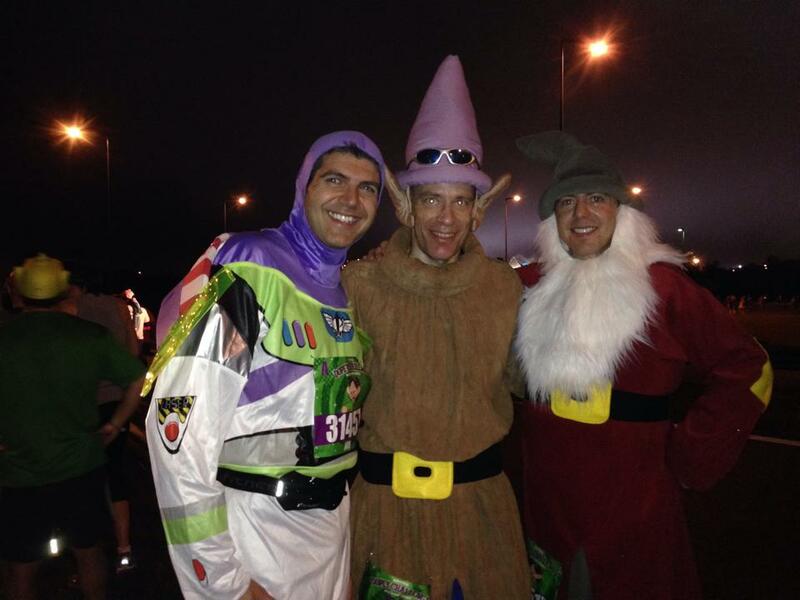 This year they had 100 runners for the weekend including 40 Dopey runners. It was announced that as of the date of the dinner the team had raised approximately $140,000 with a final total expected to be approximately $165,000 (Go Team Up!!!) I was awarded a certificate of appreciation for being the second biggest fundraiser this year. I came in second place last year to the same person who beat me out of first place the year previous. I’ll beat him for sure in 2015!!! 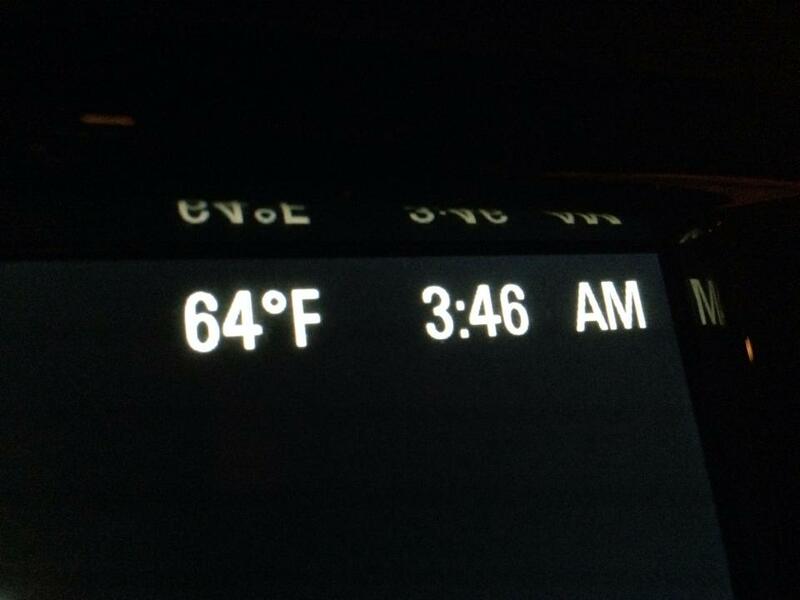 I set out from my hotel (I stayed off property about 10-15 minutes from EPCOT) and arrived early for the 6:15am start. I wanted to get there early as I would be repeating this journey over the next few days and wanted to make sure I was comfortable with the drive. It also gave me a chance to meet up with folks before we had to head for the corrals and some time to relax a bit before the start of the race. 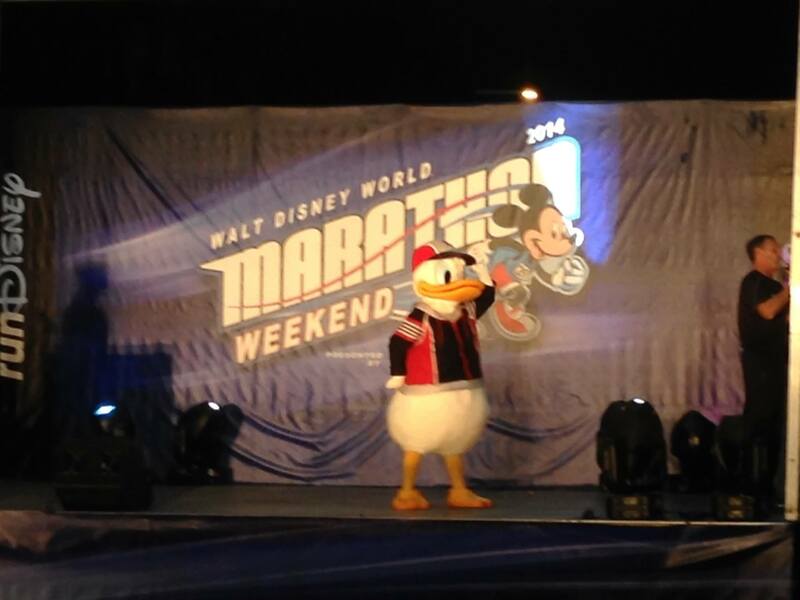 The 5K event was launched with the usual fireworks and Pluto was at the start line to send everyone off. 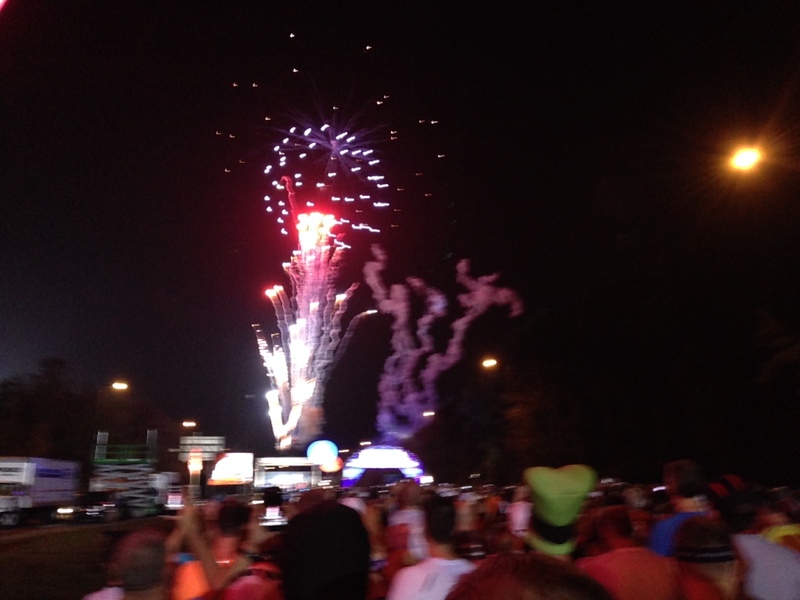 Those fireworks (something I always look forward to) were the start of what would be an amazing 4 day journey for me…and about 7,000 other ‘Dopey’ runners. 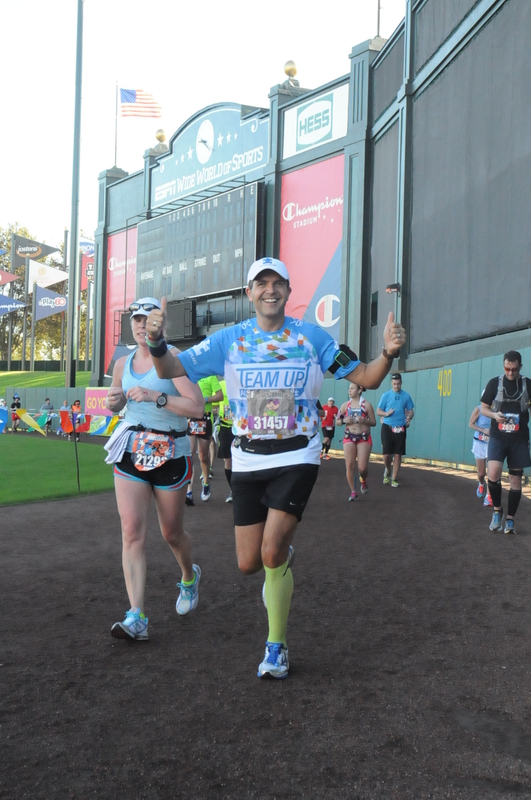 The course was the same as it had been last year, leaving EPCOT through the parking lot, entering the park behind ‘Test Track’ and winding through ‘World Showcase’ back to the finish line area just past the park entrance. Feeling a little ‘wooden’ at the start. During the 5K when I entered the Germany Pavillion I saw a long line for a character photo opportunity. 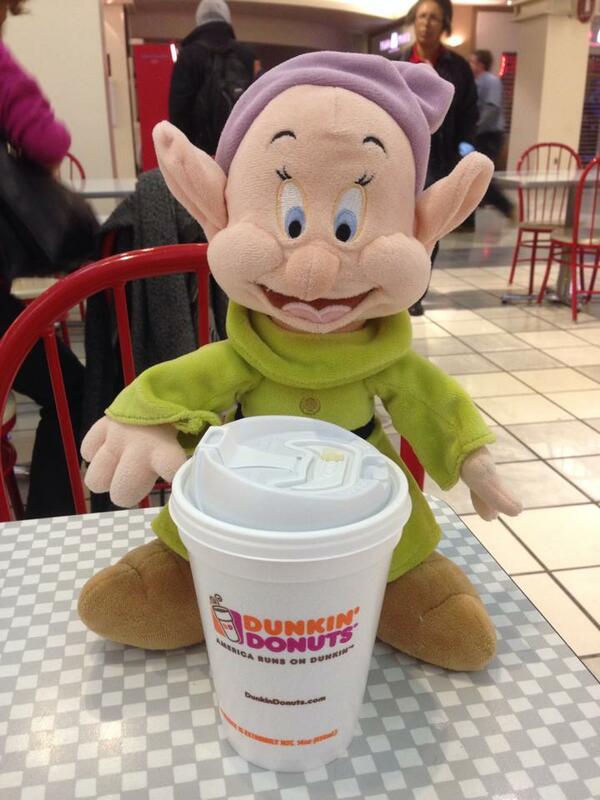 I slowed down and saw that it was Dopey. I had to take that photo no matter how long the line. One thing about Disney races is that the photographers and the cast members are very efficient about moving everyone through the photo lines. Although there was a bit of a wait for the photo it was an advantage being in corral A and getting there early. I heard that later on during the 5K the line stretched from Germany through the Italy Pavillion. 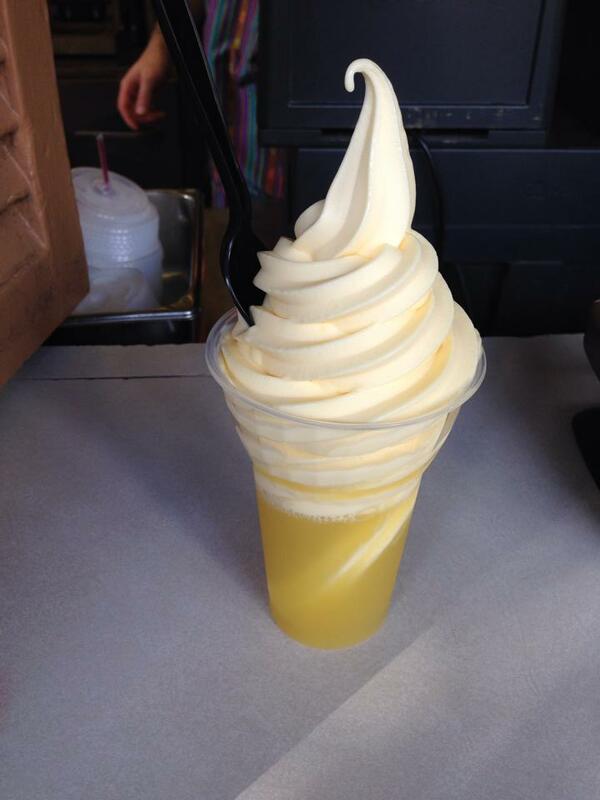 I heard people waited in line for about 10 minutes. As 7,000 of the 10,000 runners were attempting Dopey and would probably be taking the race easy I wasn’t surprised to hear that. 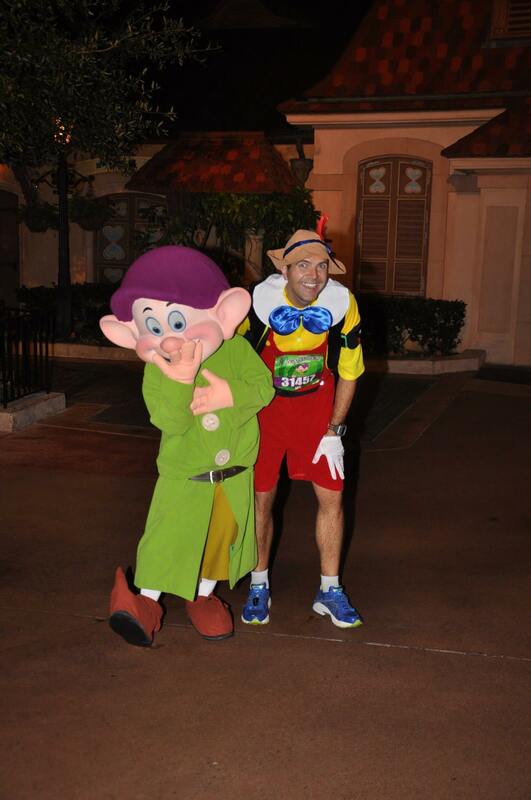 Here is my photo with Dopey. My wife is sure Dopey is laughing at my choice of costume. You can decide for yourselves. I had a lot of fun in the 5K. It’s great that the cast members are all out cheering you on and there were plenty of volunteers (who did a great job all weekend). 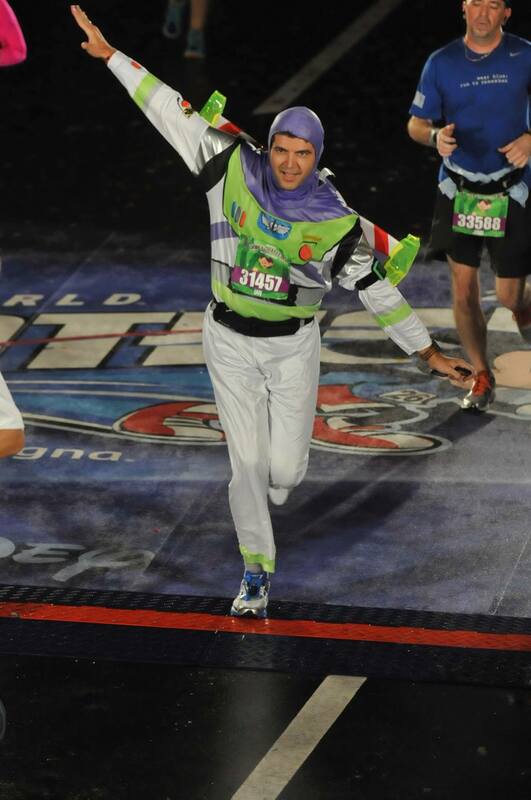 It was raining lightly when I finished the race but it kept me cool (in my red velvet costume). What was noticeable throughout the whole race was that there was a lack of ‘families’. This race is advertised as the ‘Family 5K’ and they kept announcing the fact at the start line that there were 10,000 runners. But if you strip out the 7,000 runners doing the Dopey Challenge this left only 3,000 runners (same numbers for the 10K). When signing up for this race they announced that they were getting rid of the stroller division. It seems sad that they put an emphasis on this being a family event and indeed the 5K is a great way to get young folks into running especially when they can run with other family members but the actuality didn’t match up to the name. I know I was up front in Corral A but from what I saw families were few and far between. Overall though I had great fun. It was a good opportunity to start the weekend off stretching my legs and getting in some (very) early morning Disney Magic. The medallion (first of the six for the Challenge) was cool and I had a fun time. 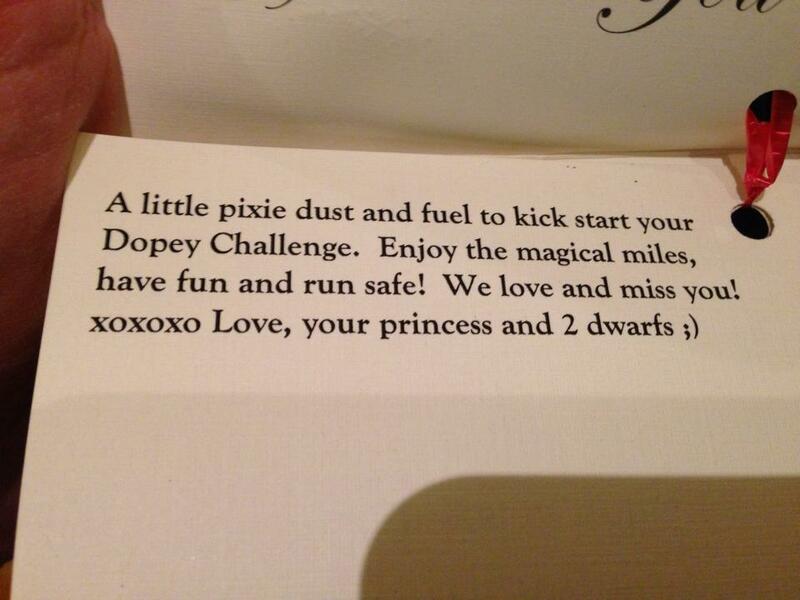 Now a quick word about the Dopey Challenge. 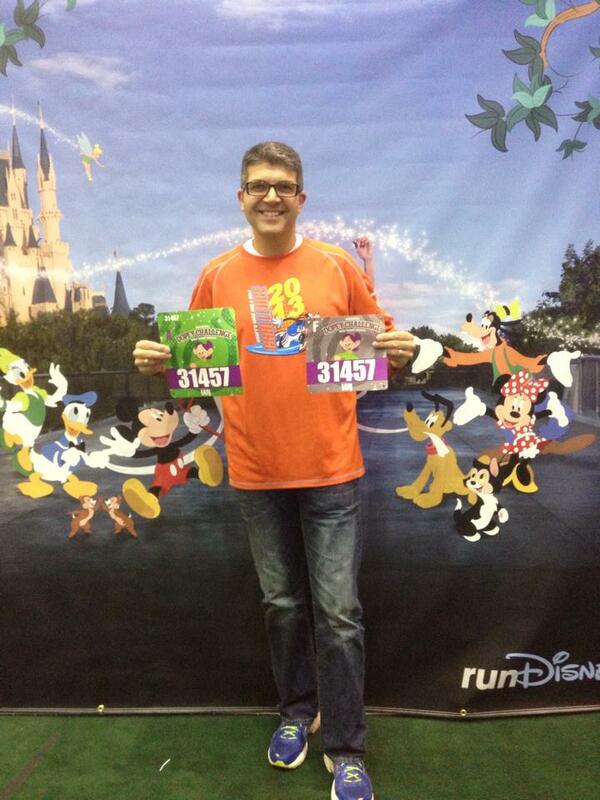 As I mentioned in my post about the Expo, Dopey runners were provided with 2 bibs. One for the 5K and 10K and another for the Half and Full marathon. 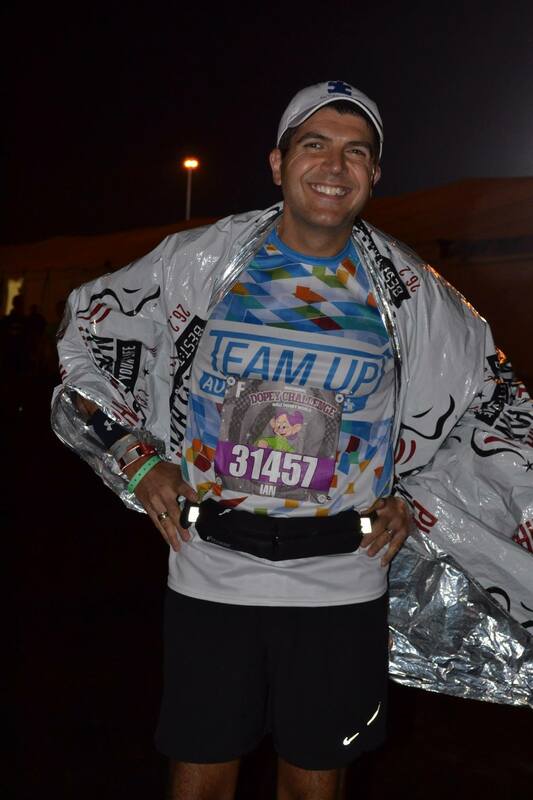 A quick tip for making sure your bib survives each of the two days. 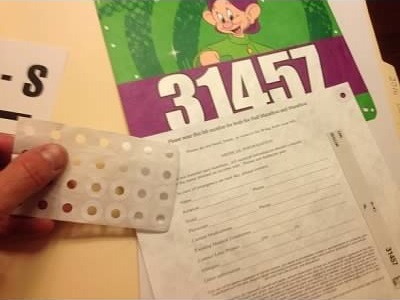 First, I attach ring reinforcers that I used to use back in my University days to make sure the bib holes were more secure as I needed to reuseeach bib, and second, after each race I had a manila folder with me so I could keep the bib flat and let it dry out a little between races. It was very warm the first three days of the Challenge and I think this did help ensure my bibs were able to make it through the races. Also, for Dopey runners and later for the Goofy runners, at the end of the 5K we were ushered over to the left hand side of the finishers chute and we were given a plastic wristband showing that we were 5K finishers. It was a bit chaotic the first day but I will say that the subsequent races the volunteers were much more efficient. Today was all about receiving the first of the wrist bands, the subsequent races involved extra steps to mark off each wrist band and add another. I didn’t stick around too long after the end of the race as (1) it was raining, and (2) I had brunch plans with the team from the Mickey Miles Podcast at the Yacht and Beach Club at 10am after the race. Brunch was great. I got to meet up again with Michelle and Mike together with other great folks who have been on the podcast or who had become friends through Facebook (too numerous to mention but you know who you are! 🙂 ) During the brunch Mike and Michelle anounced the launch of the Mickey Miles Podcast running team, the ‘Mickey Milers’ which will raise funds for the Charity ‘Give Kids The World‘. You can check it out and sign up to run with them here. 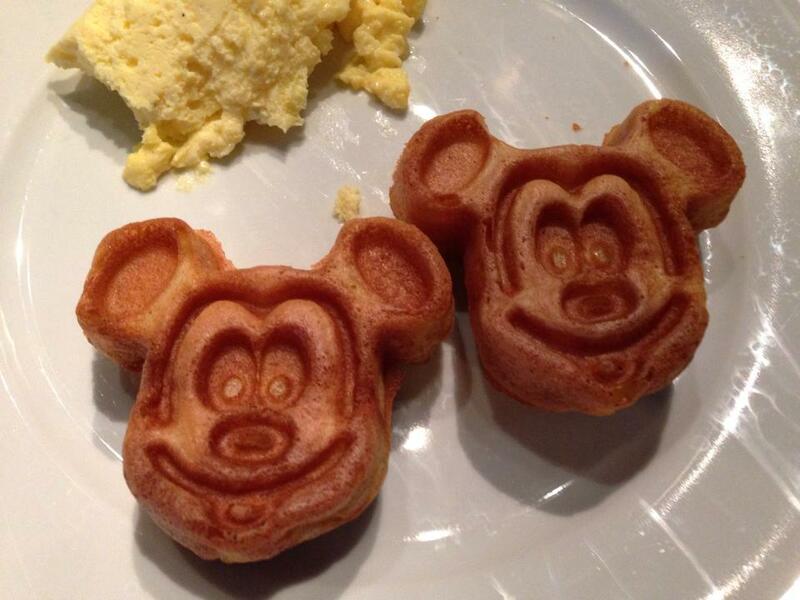 Also, a Disney vacation (yeah, right…a vacation) would not be complete without my Mickey Mouse waffles fix. Thank you Mike and Michelle for hosting. 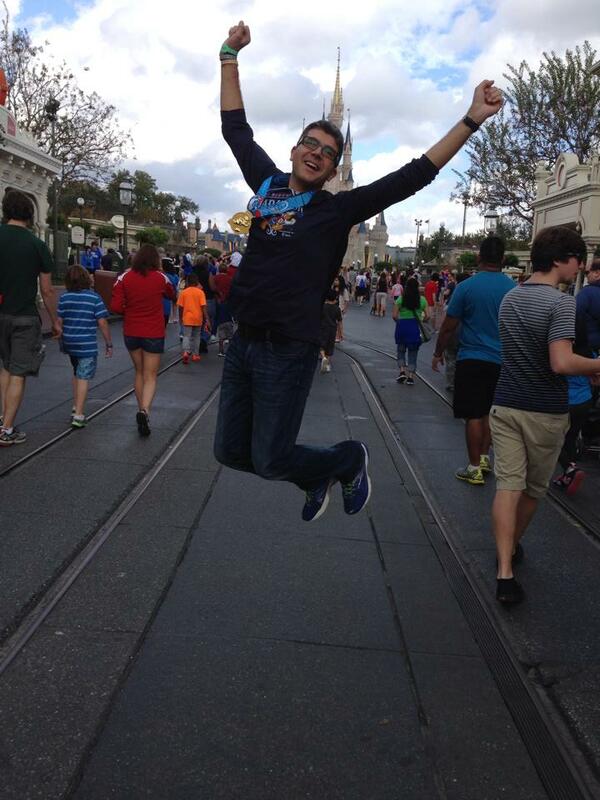 After the brunch I headed out to Disney’s Hollywood Studios for some park time. Still not doing the ‘stay off your feet’ thing I was supposed to. So I ran a 5K which is 3.1 miles, my Fitbit stats for the day ended up being 11.26 miles. We will see how that works out over the coming days. Next up, the Inaugural ‘Minnie’ 10K. I guess it is best to start at the beginning of this journey. 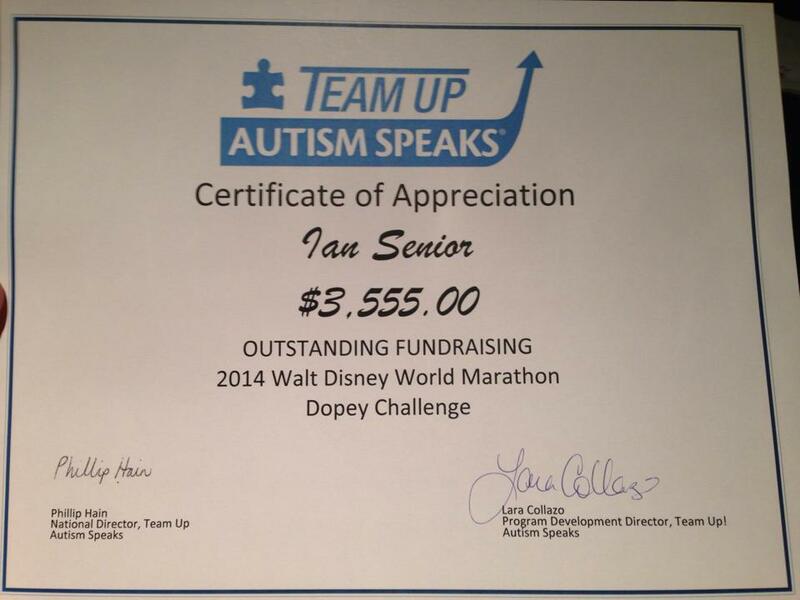 I had been preparing for the 2014 Walt Disney World ‘Dopey Challenge’ since I signed up (through Team Up for Autism Speaks) soon after they made the official announcement back in March 2013. Having done all the training as closely as possible on the plan I was using I felt good going into the weekend and my only concern at the beginning of the week was the weather and what would happen if I couldn’t get to Orlando in time. The previous few days had given us frigid temperatures, icy road conditions and lots of flight cancellations in the North East and I was beginning to freak out just a little bit. I finally decided on the Monday that I would book a hotel near the airport on Tuesday night so I could leave my car parked at the hotel, get an extra hour or two of sleep (important for the days ahead) and have someone else worry about getting me to the airport on Wednesday morning. It was a good move for me and allowed me to relax just a little bit. Incidentally the day before the I left the team coordinator for the charity I was running with reached out to all the Dopey runners in the group and offered to pick up our race packets and deliver them to our hotels. Nice. 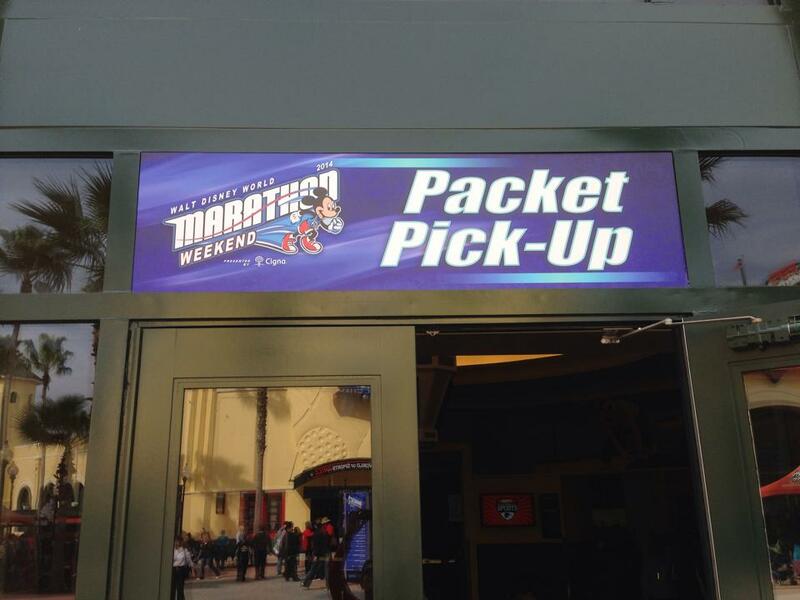 Also, I read online the runDisney recognized the fact people were having trouble getting out to the event and offered packet pick up early before the 5K to accommodate runners. Wednesday morning came (first of the early wake up calls for the week) and I made it downstairs and waited for the hotel shuttle for the airport. Looking up at the departures board my flight appeared to be on time as scheduled. Check in was quick and easy. This time around I took my racing gear in a carry on (as all the blogs and magazines advise) and this would double on the way home as my Disney gifts carry on (believe me, I filled it up on the way home). 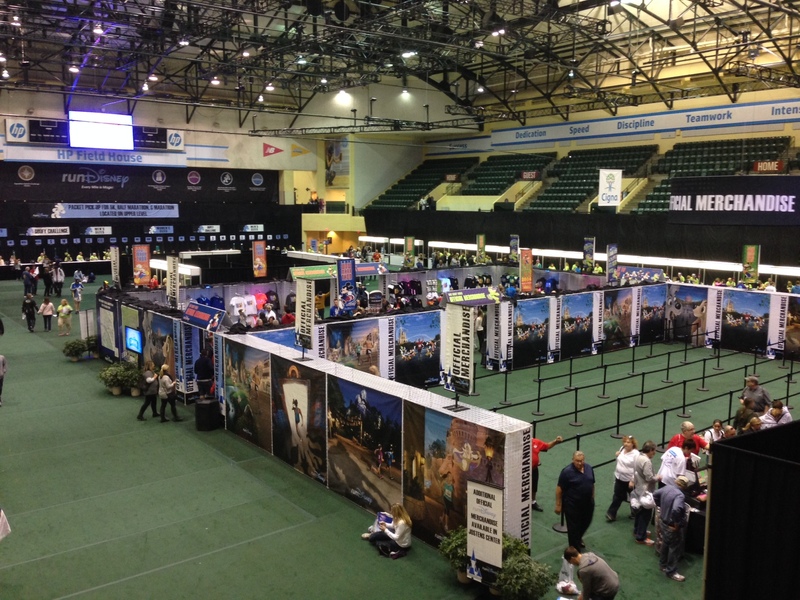 Once arrived in Orlando I picked up my rental car and headed straight to the Expo at the ESPN Wide World of Sports. Nothing beats that feeling driving onto Disney property and passing under the sign which says ‘Walt Disney World – Where Dreams Come True’. I arrived just after noon and the Expo parking was packed. I had to park in the overflow area which is essentially a field just off the main entrance. I had fears that the Expo would be crowded but to my surprise it wasn’t. It may be because today was mainly folks pickup up Dopey and 5K bibs and this year they split the Expo to other areas around the property. 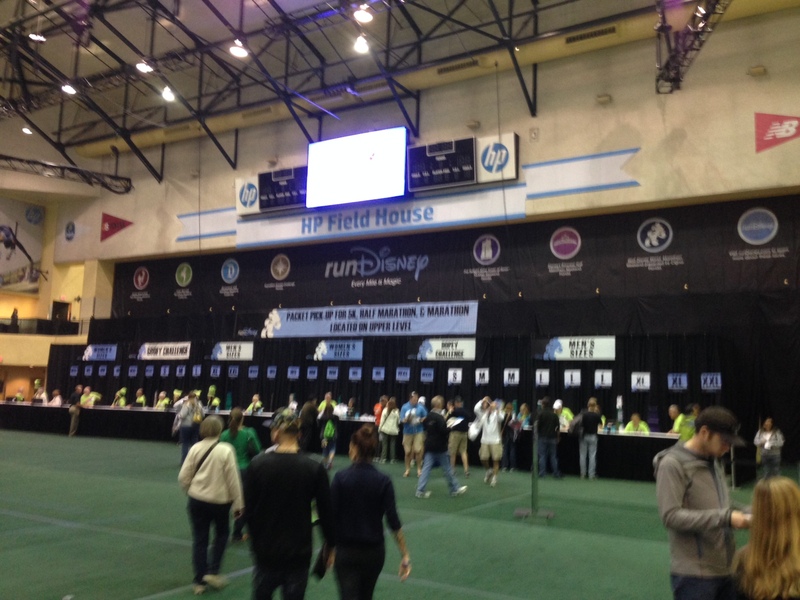 The packet pickup was as usual in the HP Field House. 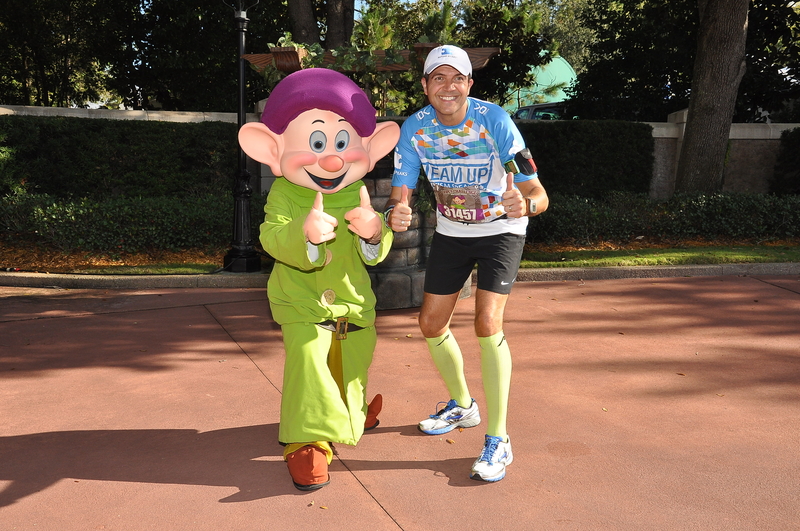 Dopey and Goofy pickup was separate from all other races and it was pretty quick, easy and painless. Once I picked up my two bibs (one for the 5K and 10K and the other for the Half Marathon and Full Marathon) I was given a ticket to pick up my souvenir pin and sent over to pick up my race bag and t-shirts. In all there were 6 shirts for the weekend (one for each race and extra for the Goofy and Dopey) and 5 of the shirts were all included in the clear plastic race bag they provided. 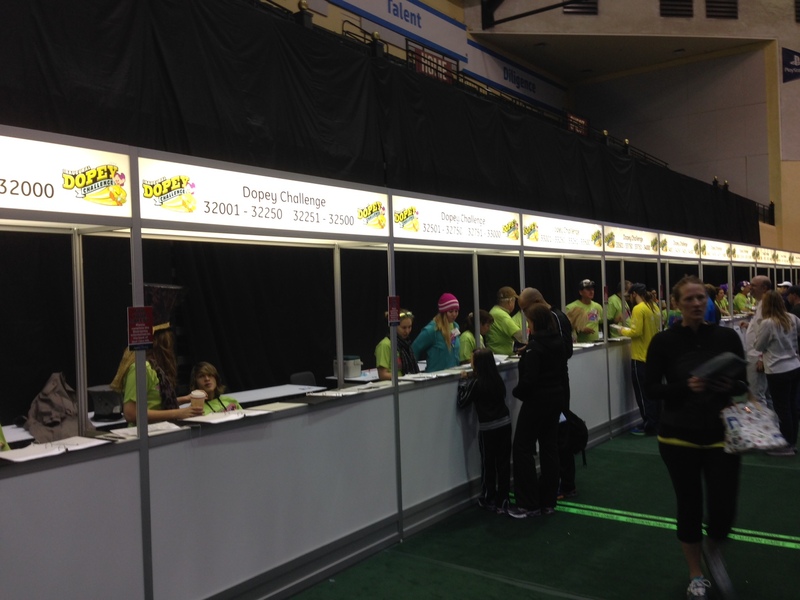 Runners had to head over to the Jostens Center to pick up the 5K shirt. There was a little merchandise in the HP Field House but the bulk was in the main Expo hall at the Jostens Center, so that was my next stop. T-Shirt pick up was well organized. Shirts for each event were packed together. Some merchandise in packet pickup area. Not too crowded on this side. Just a word about the shirts for this year. Rather than the usual unisex shirts (except the 5K) there were women’s cut shirts as an option for this year. The actual shirts felt a little larger than last year and were of a slightly softer material and again were long sleeved. Last year was a heavier, coarser, paneled shirt vs. this year’s shirts. Overall I liked the shirt designs and the colors this year. 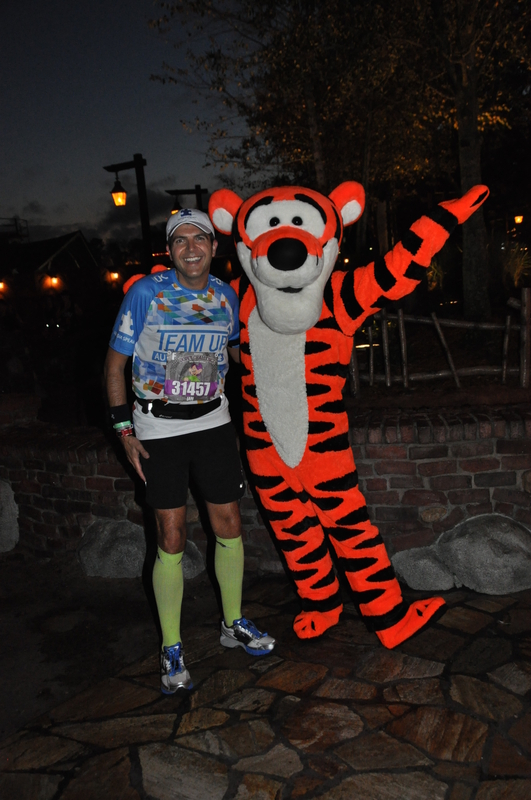 Even the short sleeved cotton 5K carried over the theming on the shirts. 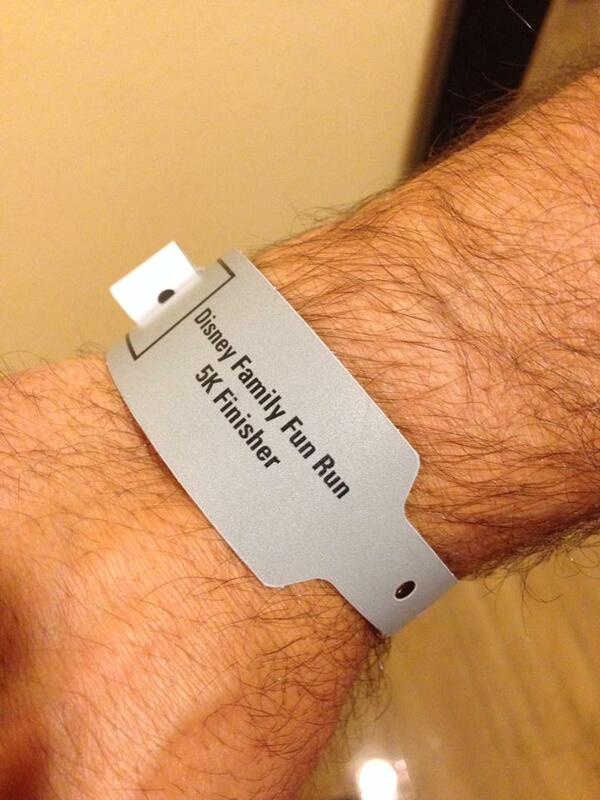 Over at the Jostens Center I hit the runDisney merchandise area. It was crowded but not manic. 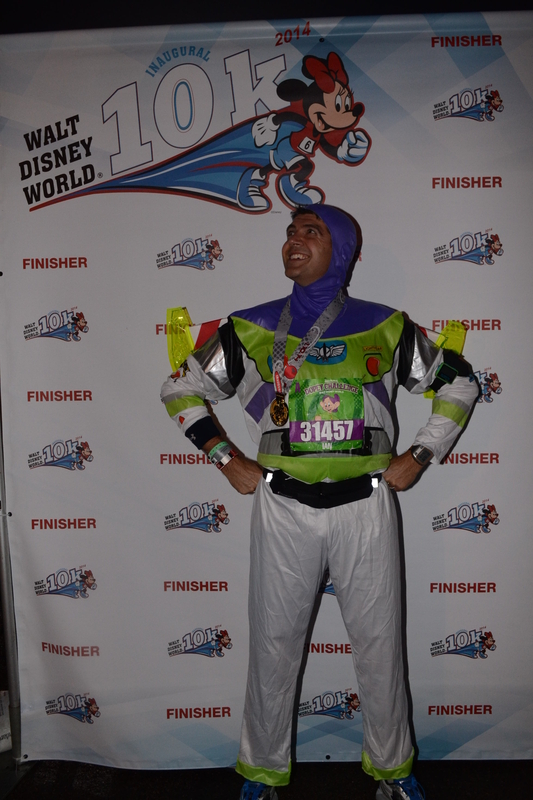 Each aisle seemed to be dedicated to each race but mainly 10K, Half, Marathon and Goofy. There was some Dopey merchandise (after all there were 7,000 people who signed up) but not as much as I would have expected given it being an inaugural event. Nevertheless I got what I wanted and because there wasn’t too much I actually spent less than I had budgeted (phew!!!). I got to use the Disney Visa gift card the boys got me for Father’s Day and together with the 10% discount for my Disney Visa Card I left the runDisney merchandise area just under $70 lighter. The Expo was quite spacious with less crowds than I had experienced in 2012 and 2013. This may be as I said earlier because it was mainly Dopey folks (Marathon and Goofy runners would probably hit the Expo over the next couple of days) and also because I had no kids in tow this year but it was also because they spread the Expo to Champion Stadium. I spent a little time at the Expo, not really shopping as I have been to umpteen expos in the last year. What I did do is walk around chatting to folks. 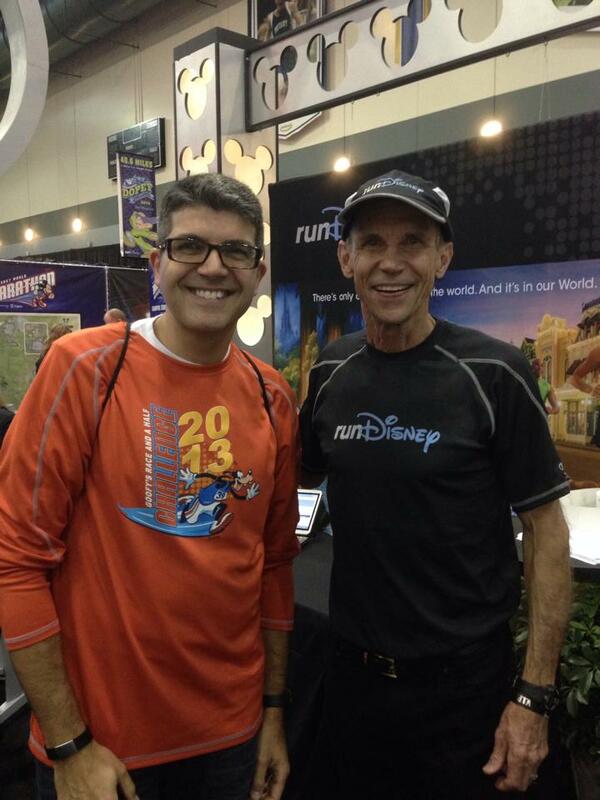 I stopped by the runDisney booth where I met Rudy Novotny who was walking around the floor announcing folks at the expo and also I finally got to meet Jeff Galloway (after three attempts if you count 2012 and 2013 runDisney expos). I also got a chance to meet Sarah from sparklyrunner.blogspot.com who I bumped into over the next couple of days along with many other folks. 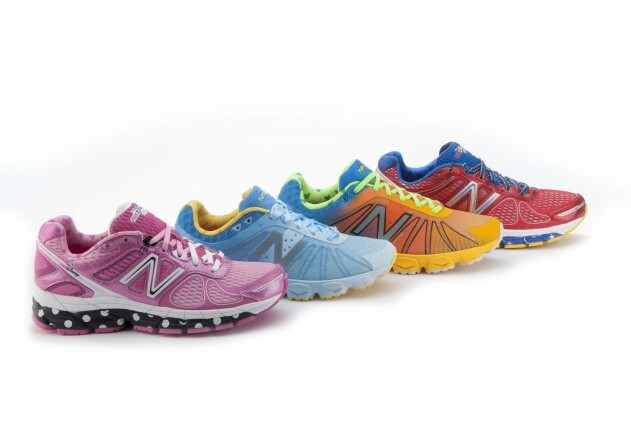 I came into the Expo too late in the day to sign up for the New Balance Disney running shoes. I’d heard about 2-4 hour waits for the shoes (including sign up and appointment time) and I had plans for dinner and wanted to get out to the parks early. Although I like the look of the shoes (especially the Goofy shoes) I am not sure I would really wear them (nor would my wife really allow me to). I saw plenty around the park and I have to say the Goofy’s did look good. 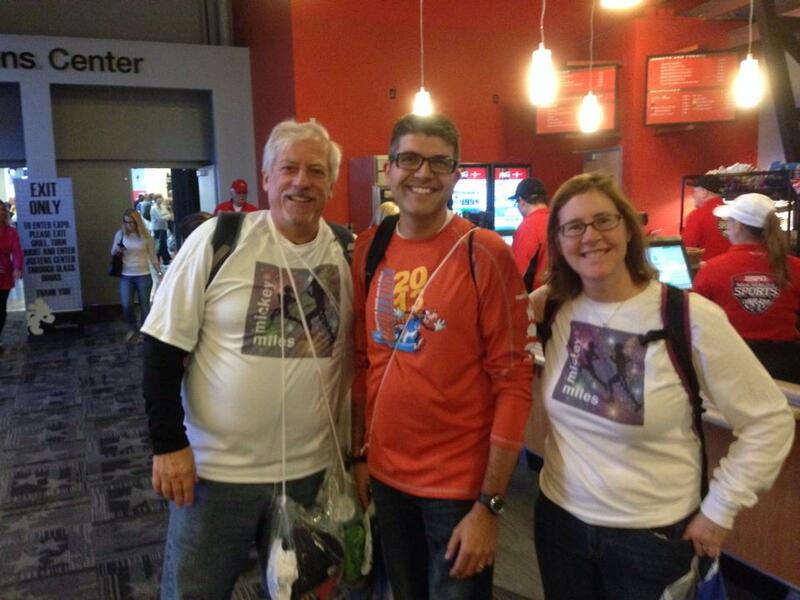 On my way out of the Expo I bumped into Michelle and Mike from the ‘Mickey Miles Podcast’ and said a quick hello. I would be attending their brunch tomorrow after the 5K. 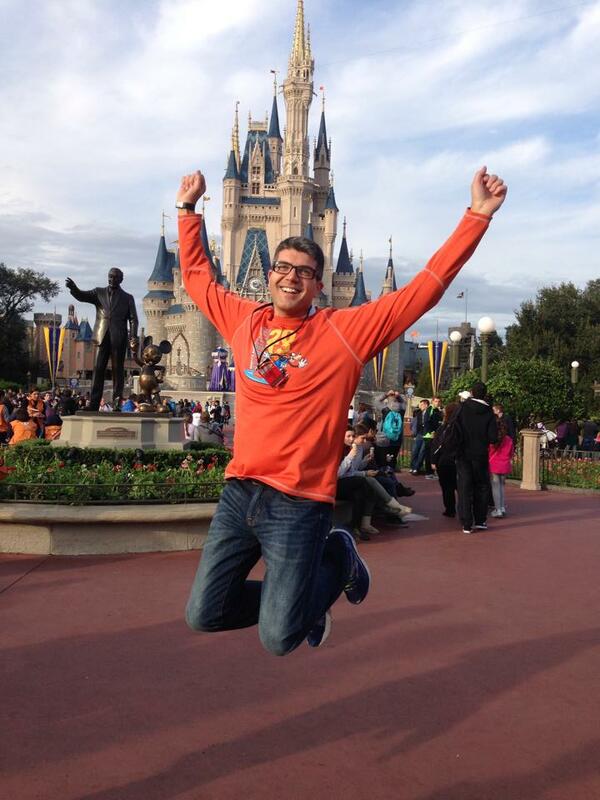 It was nice to meet up with everyone at the Expo but I had plans in the Magic Kingdom that night so I left the Expo early and made my way to the park. This was to be my ‘late night’ so I made a dinner reservation (Tony’s Town Square Restaurant), took many photo ops and stayed for the ‘Wishes’ fireworks spectacular before heading back to the hotel to check in and get my 5K race gear ready. Just as an aside, on the eve of my arrival in Orlando my wife forwarded an email for an order she had place with ‘Disney Floral and Gifts’ so when I arrived at the Magic Kingdom I headed straight to City Hall and picked up my gift. As you can see from the pictures below my wife really knows how to treat me well. 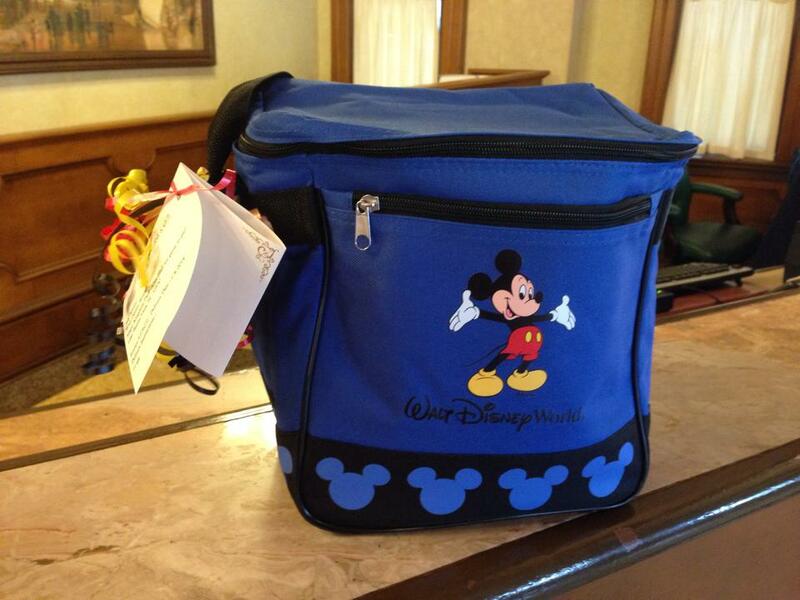 She had ordered a Disney cooler full of Disney treats. 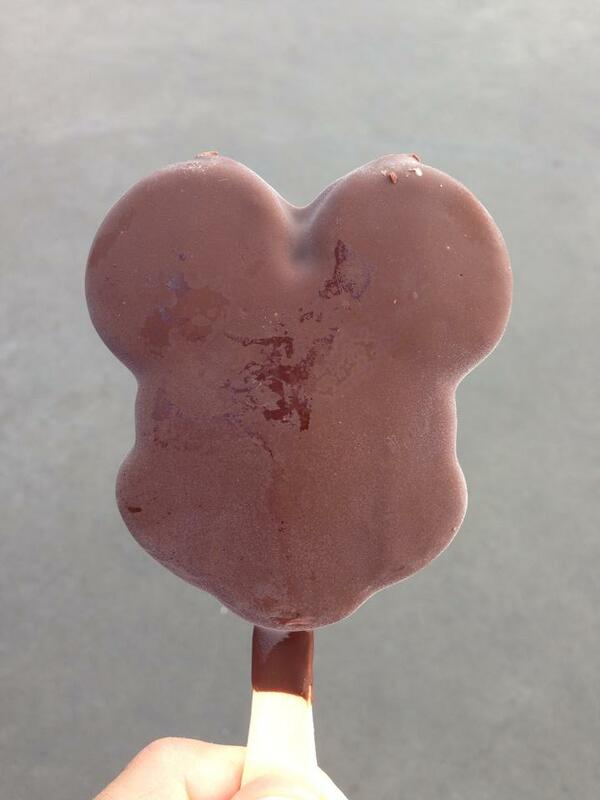 It came in handy for waiting in line that day. What a great start to my weekend. 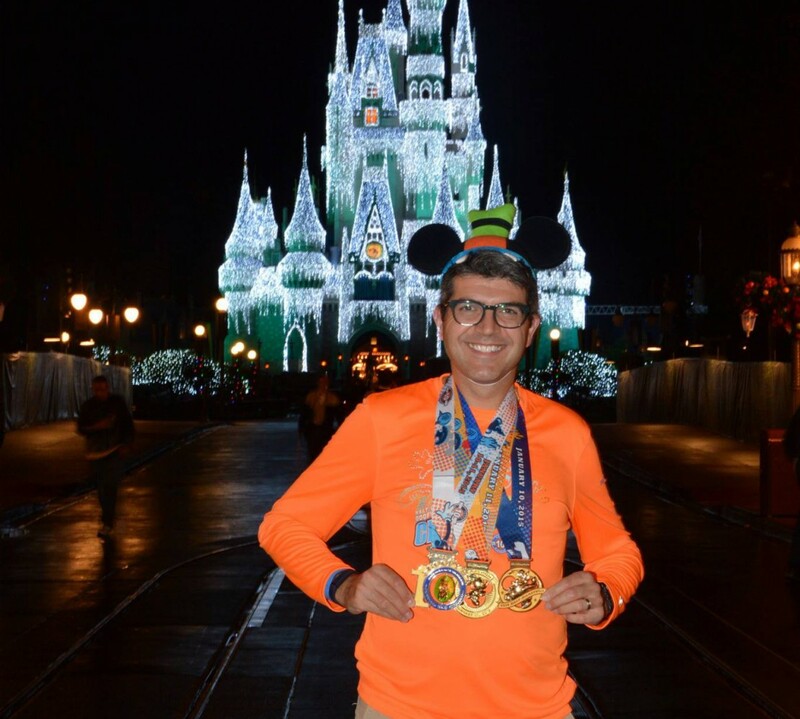 Michelle and Mike at the Mickey Miles Podcast invited Kimberly and I as guests of their show to review the recent Dopey Challenge that was part of the 2014 Walt Disney World Marathon Weekend. In the previous episode we talked about the Expo and 5K. This is the second of the 2 episodes and covers the 10K, the Half Marathon and the Full Marathon plus our overall weekend wrap up. Again, if you haven’t yet done so, please check out the show. 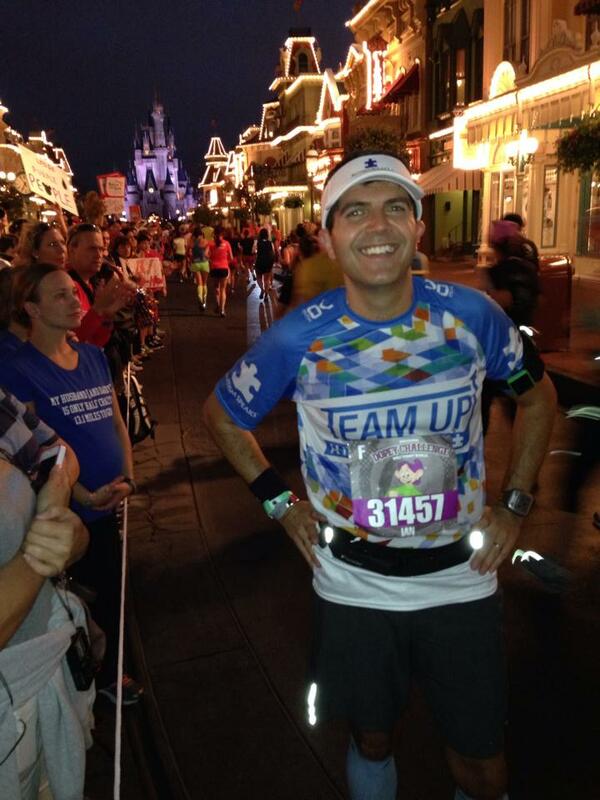 It’s a great podcast about Disney races and all things Disney.